A CLOSED for UpDate message = Dead links until relevant pages become available. Some internal links will also brake until relevant internal pages become available. However; some links do work. WELCOME TO THE HOME of PAN, islands of Calypso, Soca, Chutney and so many other culturally diverse things, that there is neither enough space, nor is it the place here, to list them all. EXPLORE THE ROOTS of PAN through these developing pages, and meet these utterly unique steelbands in their tiny home islands. WE SHALL REMAIN INDEBTED to ULF, both for his Steel Drum Research and for his foresight, for setting up such a splendidly accessible World internet Forum for Pan. His pages staggeringly illustrate just how, the preoccupying hobby of a few of our islands music lovers, whose legacy you visit here, has now rewardingly grown into an internationally accepted, world-wide musical experience. and where to find them at Carnival and other times. Tracing the roots of the first steelbands; and the struggle for the Steelband Movement. A study of the Steelband dated 1959; with the "Mussel-Rat" story of rhythmic pan origins. A note on the first steelbands in the South of Trinidad. Commemorating an early steelband from South Trinidad. 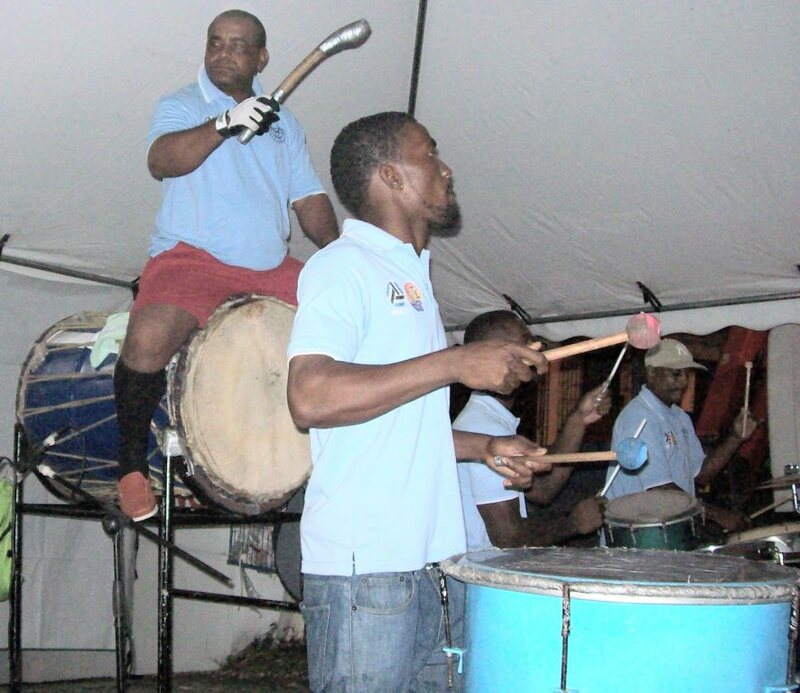 Historic roots from tamboo bamboo to the steelband. Review of Spree Simons discovery. eMail note from John Schmidt detailing one of the earliest steelband recordings. What is Tamboo Bamboo? With some pictures. Neville Jules from the famous Garret to the J'Ouvert morning Bomb competition. Operation Britains TASPO of 1951; pivotal to the future history of the Steelbands. Methods of Production, Tuning, Materials, Rawforms, Note Architecture, Pang drums. Definitions + History + Music Education in Pan at UWI. The events history from concert to competition; 1998 to 2005. (Winners Table UpDated to 2011). The Trinidad & Tobago 1995 Pan Reference List and About it. All Conventional and Traditional bands known to be active at that time. A count of all the Steelbands in the World. Sell it to a tourist! The steel drums, or the steelpans, were declared the National Instruments of Trinidad and Tobago in 1992. The following notes could be of more interest to those who are not already familiar with the steelbands of Trinidad and Tobago; but should also entertain those who are. They are specific to the Steelbands of Trinidad and Tobago and attempt to briefly describe steelbands in the living environment in which they function. Being the home of the Steel Drums; there exists here, particular cultural and social mores and traditions that have grown up together with the development of the steelbands. It is hoped that these notes capture references to these traditions that form such a fascinating backdrop to this unique facet of our musical culture. which is all about making and tuning these steel drum instruments. In his preface, which you should visit, can be found a heading STEEL PAN HISTORY; this of course is an amusing editorial shortform for what is dually, a concise history of the Steel Pan instruments and of the Steelbands themselves. It is hoped that the reader will discover new detail of the steelbands colourful history; find alive some curious traditions; meet some of the characters; and understand better the steelbands of Trinidad and Tobago thereafter; from browsings within these developing themes. There is one essential thing that one should always remember when entering into discussions about Trinidad and Tobago steelbands; the steelbands are the entities that evolved to put music, on the carnival "road". Ah lookin' for a G..! We are now walking up the stairs of the years at the beginning of the 21st Century, some near 70 years after the birth of an unusual cultural heritage termed the Steelbands of Trinidad and Tobago (TT). But what are the Steelbands of TT? We need first to traverse a little legacy cultural 'word play' within the context of the semantics of the words 'Tradition' and 'Traditional', as applied by TT to their indigenous steelbands, to find a meaningful answer. We can start with a basic root of tradition, in that the steelbands of TT are mostly all voluntary groups of participants, drawn from usually local sites or communities, to pursue an indigenous musical art-form that they all fondly recognise and simply call 'Pan'. We expand this with one further simplistic note to stress only that; the participants usually volunteer their time and energies with no expectation of financial gain, but rather mainly for the joy of a shared social experience. The evolutionary arrival of 'Sponsors', 'Panorama' and 'Prizes', would tarnish this voluntary tradition somewhat with 'contract players' and the carrot of '10 minutes of glory'; but that particular story, unfolds here later, in a different section. Starting from groups of mainly the under-privileged in TT society, but with some extraordinarily focussed and talented individuals in the mix; the 'panmen' or 'steelbandsmen' (kindly excuse the sexism for the moment) were so busy in developing and playing their 'Pan', that they had little regard to such academic notions as 'the march of time' nor 'history'. It took them about two and a half decades, or near 25 years later, to realise that their steelbands had evolved to diverge along two different paths. 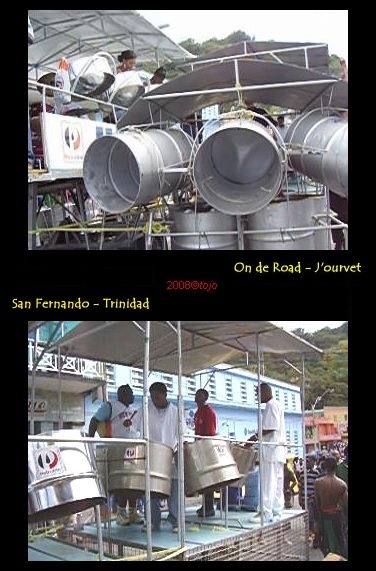 Although 'historically' both may be classed as The Traditional Steelbands of TT, local mores muddied the definition with the following local naming. The steelbands that still performed with a single 'pan' per player, carried with 'round the neck' straps, were labelled the 'Traditional steelbands' or the 'Traditional Pan 'round the neck' steelbands. 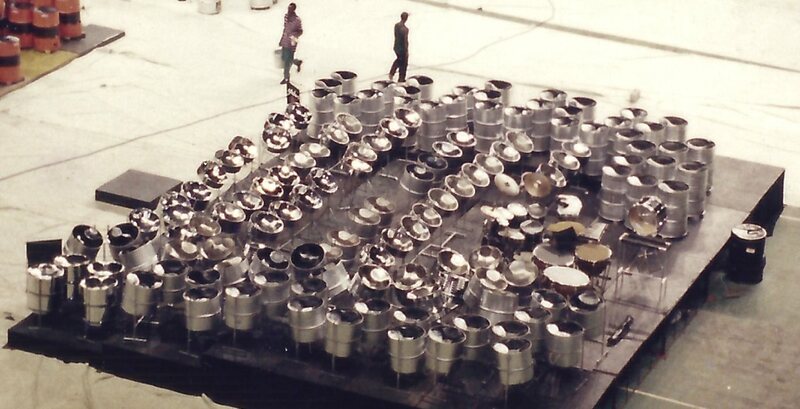 The steelbands that performed with the newly evolved double or multiple-pans per player, arrayed on 'racks', were labelled the 'Conventional Steelbands'. The 'Traditional Pan 'round the neck' would later be relabelled as the 'Single Pan Bands' (SPB's) . This would put the slightly ambiguous 'Traditional' and the unwieldy 'Pan 'round the neck' terms, into one tidy box; but all these naming 'details', and the differences within these steelbands, are again visited here, in different sections. We should however note that at present; these Conventional and Single Pan Bands make up the bulk of the performing 'Panorama Steelbands' of TT. Because this group of steelbands are all derived from the same historical beginnings, or the cultural 'roots,' of the steelband art-form of TT, we class them all together as the Traditional Steelbands of TT. e.g. Central Symphony (TB, Small), Dem Boys (TB, Small), Flamingoes (ET, Small), New World Symphony (El Dorado) (ET, Small), Merrytones Steel Orchestra (NT, Small), Morvant Ebonites (NT, Small), Morne Diablo Philadelphians Funkadelic (SC, Small), Starland (SC, Small), Dixieland (TB, Medium), West Side Symphony (TB, Medium), Arima Angel Harps (ET, Medium), Sforzata Steel Orchestra (ET, Medium), Panatics Steel Orchestra (NT, Medium), Valley Harps (Deigo Martin) (NT, Medium), San City Steel Symphony (SC, Medium), Trinidad Valley Harps (Penal) (SC, Medium), Redemption Sound Setters (TB, Large), birdsong Steel Orchestra (ET, Large), Starlift (NT, Large) and La Brea Nightingales (SC, Large), all Conventional steelbands; Get Down On It (TB), Hope Pan Groovers (TB), Pan Stereonettes (ET), San Juan All Stars (ET), Belmont City Kids International (NT), D' Original Woodbrook Modernaires (NT); Scrunters Pan Groove (NT), Jah Roots (SC), Rio Claro Koskeros (SC), all Single Pan Bands (SPB's). Further classes of steelband would also evolve over time. One thread may be loosely classed as the 'Non-Panorama' performing steelbands or groups; some armature and some professional. Composed either entirely of 'steelpans', or with a mixture of other musical instruments (e.g. keyboards, guitars, electric bass etc; could include vocalists); enthusiastic 'panpeople' would make up the mix of these performing ensembles. e.g. TT National Steel Symphony Orchestra (NSSO), Samaroo Jets, all steelpans; Kaizen Fuzion, mixed ensemble with vocalists. Along this thread also string a clutch of secular or religious oriented steelbands, that were formed by, and perform at, their respective religious institutions. e.g. Faith Revival, Glory Tones. Another class of steelband would be the learning Institutions or 'Pan Schools', targeted mainly at youth development, which could solicit paying students; but are mainly formed and managed by insightful people directly from within the 'Pan' community. The students, present and past, engendered with student-commitment, or past-association-loyalty; to make up the numbers if necessary; allow the group to perform at functions, Music Festivals and at 'Junior Panorama' or 'Panorama'; as required. Many of these institutions teach music literacy, together with the cultured technicality of pan playing. However, few of these institutions are directly accredited for music examinations; so instead link their activities with accredited School or University classes, to which interested students are sent to sit their music examinations. e.g. Golden Hands, Revelation Institute of Performing Education. Some of these institutions however, profess a 'non-Panorama' policy. e.g. Diatonic Pan Institute, Union Hall South-Landerz Steel Orchestra. The final class of steelbands to arrive are the School Steelbands. 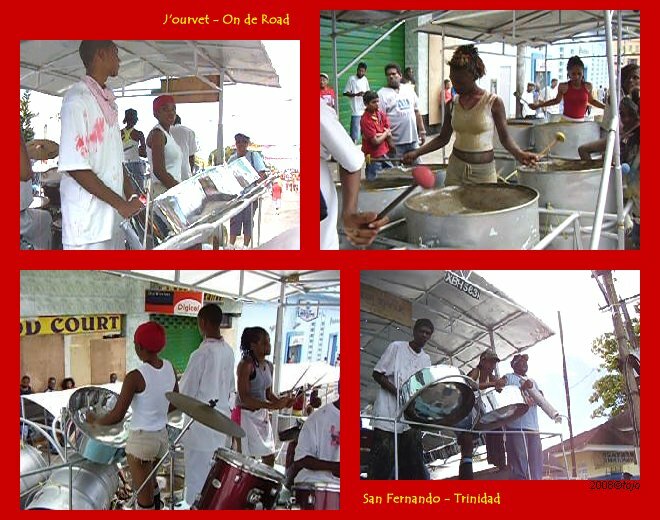 These steelbands are youth ensembles; formed in music classes of the Government or Institutional Primary and Secondary Schools of Trinidad and Tobago; most of which are teaching accredited music classes. 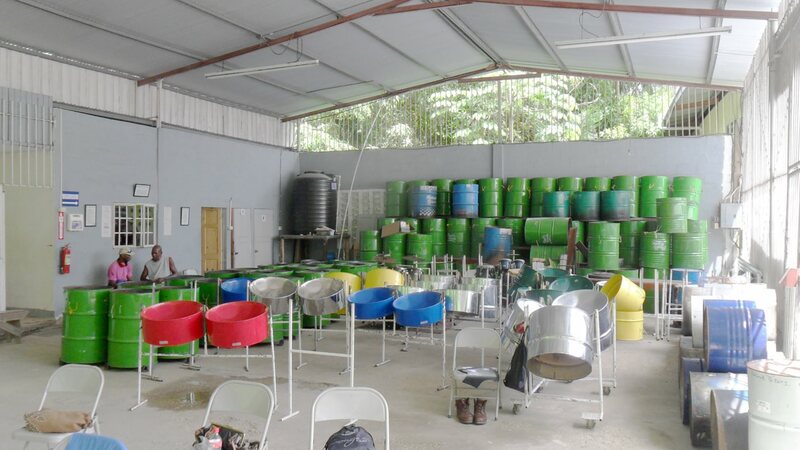 Supported by educational initiatives such as the 'Pan in the Classroom' and 'Pan in Schools' programmes, these steelbands perform mainly at their schools, or for their school projects; displaying to their school and parents, their learned musical proficiency. Some may venture further; to enter Music Festivals, and the seasonal Pan Trinbago 'Junior Panorama' competitions; events from which results a School's musical acumen, can be brought to high and desirable acclaim. e.g. Bethlehem Girls & Boys RC Primary, Primary School; St Joseph Secondary (St George East), Blazers of Steel, Secondary School. There remains one sub-set of steelbands to this 'youth development' class. Coming out of the Traditional Steelbands of TT, be they Conventional or a SPB; are the 'Youth' or 'Junior' steelband arm of the respective institutions. For well established steelbands, these 'Youth Bands' may be permanent ongoing projects. 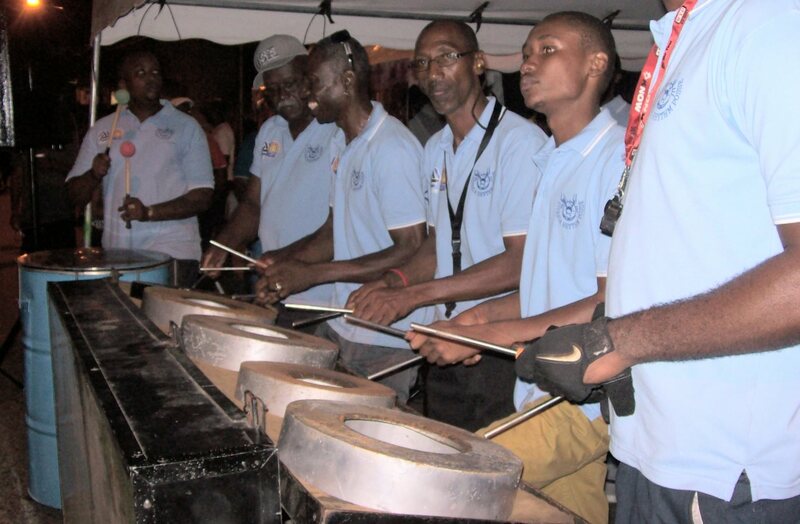 Many of these Traditional TT steelbands now run seasonal mid-year 'Pan Camps', or 'Music Literacy' programmes, as some would prefer to call them. They act as either 'youth induction' or 'community outreach' programmes for the respective steelbands. They usually culminate with a prize giving and performance show, to parents and guests, at their respective panyards. Sometimes, because they all occur in the same mid-year period, these youth ensembles may be invited to appear together in public; as they do in San Fernando, Trinidad; an initiative with some transport sponsorship from the City Corporation, and other aspects supported by interested City businesses. 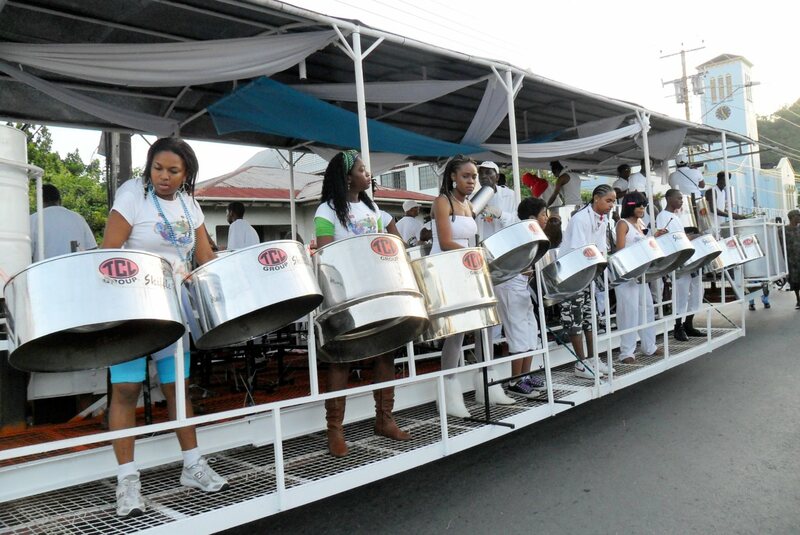 In general, the 'youth arm' of these Traditional Steelbands of TT, may appear in the Non-Schools segment of Pan Trinbago's 'Junior Panorama'. A distinguishing feature of this class of steelbands, is that they will carry the sponsor-name-tag of their parent institutional steelband; e.g. bpTT Renegades Youth Steel Orchestra, birdsong Academy. A Tinpan Band may be defined as a group of players using instruments made from collections of melodic-tuned tins. Each instrument is made up of a group, a voice, of individually tuned tins or tinpans, as they can singularly be called. Each tinpan may carry from 1 to 4 musical notes; depending on the diameter of the tin. The tinpan 'note(s)' is(are) usually derived from 'sinking' a depression at one end of the tinpan, which is 'tuned' to a 'pitch' in similar method to a steelpan, becoming the 'top'; the other end of the tinpan being left 'open' and becoming the 'bottom'. The tinpan is played by striking the 'top' note(s) with a panstick, similar but usually thinner in stock, to those used for a steelpan. The striking end of the panstick may be plain, or buffered with a 'rubberised' type material, dependant only upon the musical 'effect' the player wishes to impart with the instrument. In mimic to the steelpan instruments from which their origins are based; each tinpan voice has the same name, and is made up of approximately the same range of musical notes (but not necessarily all), as a known steelpan instrument voice. 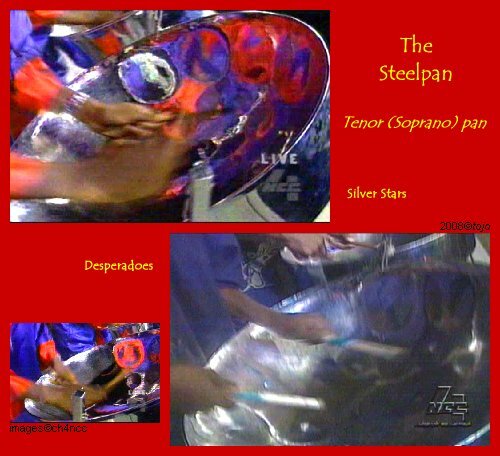 Each tinpan voice may, in the tradition of the steelpan, be called a 'tinpan pan'. So as examples; there will be 'tinpan pans' named; tenor, seconds, guitar, cello and bass. A 'tinpan pan' can be arrayed in either of two ways. Either as a collection of tinpans held together in a wire-type basket or frame; or simply as a loose collection of tinpans orderly set out on a 'table' or 'playing' top. The order in which the 'tinpan pan' tins (notes) are set, is non-standard, and is so set as to the preference only of the player. Tinpan bands are very rare, and may be considered as 'transient' entities. They are usually formed by enthusiastic youth from a close community, who catch the 'fad' to form a band, make their inexpensive tinpan instruments themselves, out of mostly discarded food tins, because they cannot afford a real steelpan; practice and perform together for a season or two, and then disband; as they move on to the other necessities of life. The Tinpan and Tinpan bands, which have historically been nearly overlooked, and remain widely undocumented, will be discussed further in a later section. 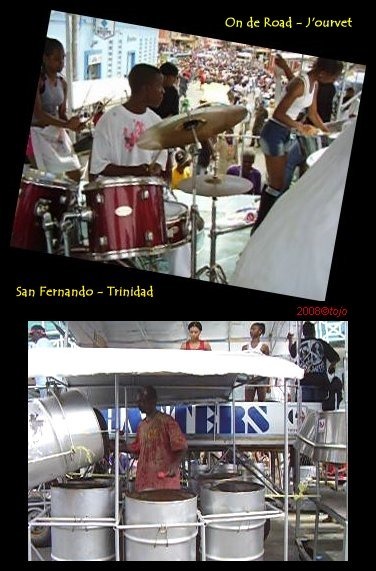 Largely unnoticed and widely under reported, are two groups of entities directly related to the roots of the TT steelband culture. The first pre dates the culture, and the second, a new evolution. These are the percussive ensembles, the 'tamboo bamboo' bands and the TT 'Rhythm Sections'. The next group, the TT 'Rhythm Sections', are a sub-evolution out of the steelbands, and have also evolved a new 'steel drum' drum instrument, specifically associated with themselves. To understand these bands, we first take a detour to recall a cultural tradition from San Fernando, that is now lost. 'Lord Street Corner', the top of the hill at Lord Street, San Fernando, Trinidad, became famous and so named, for two things. Its collection of bars or 'rum-shops' and the 'iron'. The 'rum-shops' would be particularly busy at the week-ends, the patrons over spilling into the streets, and always in need of musical entertainment. Within one bar in particular, at the top-left as you went down the hill, The Top Drive rum-shop with a proprietor fashonably called 'Wheeler', music was provided from within, on loud-speakers, in the true literal sense of the word. At some past point in time, around the late 1960's, somebody brought a steelband 'iron', the brake drum variety, and placed it on a stand at the entrance to the bar, and there entertained himself and anyone else who cared, or not, to listen. There started the tradition of 'iron' at the corner. Approaching carnival time, the 'iron' would increase to groups of highly spirited 'iron-men', incessantly 'cutting' to the music at the corner. Post carnival, the 'iron' would go sporadic, blossom around public holidays, but in the main, it was always 'there'. That was until around 2005, when the buildings owner rebuilt a large chunk of the 'corner', and both the bar and the 'iron' beating tradition there, was lost. A few years before the passing of the 'iron' at 'Lord Street Corner', the practice had been started at a popular 'after work lime' bar, the Karat Shed, along the old Southern Main Road, opposite Allum's Supermarket, in Marabella. There, the practice continues today. The 'iron' at 'Lord Street corner' is now accepted as the seed point of the 'iron' beating tradition that has now spread to many bars and 'run-shops' around TT. It also seeded the start of the 'Rhythm Sections', that would rise in complexity, as further time passed. 'Rhythm Sections' started simply as a long rack of multiple 'iron' beaters, up to 6 players, playing alone, revving up and down in speed, to standard calypso 'cutting' beats. These were rhythm 'parties' is spirit, by enthusiasts, enjoying a little 'beating' competitiveness, while burning up the 'rum'. Some got more organised, inventing learned rhythmic passages, based mainly on local calypso and African traditions, and incorporated other common percussive instruments; scratchers, cow bells and toc-toc's. With time, some groups stuck together, enjoyed a degree of local acclaim, and got even more serious with their rhythmic exploits. They added congas, bongos, drum sets and a mixture of African drums, to their ensembles. They practiced and demonstrated lengthy rhythmic 'tunes'. They now became the core of the 'Rhythm Sections' we enjoy today. 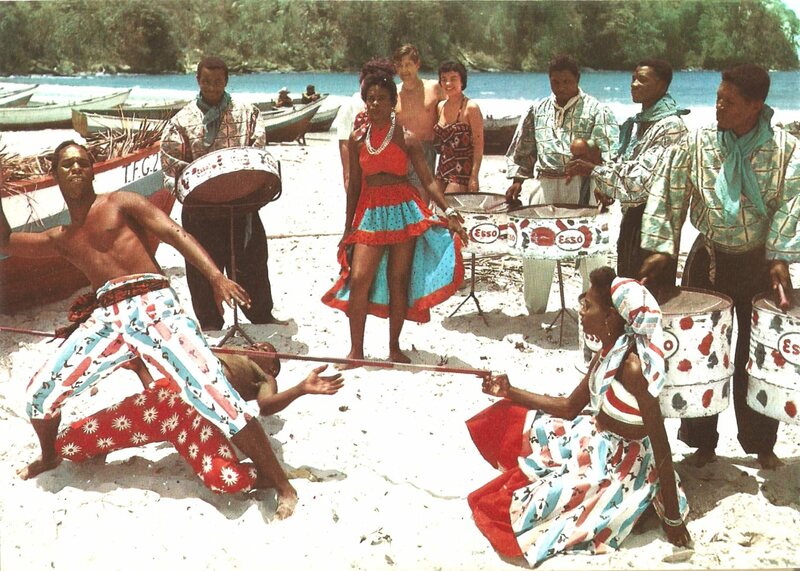 Acclaim and fame brought the better organised groups into the limelight; when invited to perform at various cultural events around the islands. Eventually, carnival-Mas organisers, would bring them out onto the streets for J'Ourvet and night Mas, where they would perform in specially constructed racks or floats, pulled by heavy duty vehicles, or on covered constructs placed on the bed at the back of a truck. The 'Rhythm Sections' had arrived. The competitiveness of the 'Rhythm Sections' would see the evolution of a new type of drum, that has arrived only within the last decade. Seeking to outdo one another, with a bigger sound footprint, they started to use as large a bass drum as they could get. These started as the inclusion of the large bass drums out of the African and Tassa drum stables. Some even found instruments out of the large Japanese drum stable. These large drums would be played with the drummer straddled over the drum, or horse-back, and beaten with especially large, slightly hook-shaped, padded sticks. Although effective, these authentic drums were scarce, cherished by their owners, of some delicacy, and very expensive. TT inventiveness came to the four where, from right under their very noses, a tinkering soul adapted the ubiquitous 45 gallon steel oil drum, to the required design. Removing the top and bottom of the steel barrel, welding suitable fixtures to the sides at the top of the barrel and fabricating a suitable ring for a clamp, attached by bolts to the side-fixings; the inventor used a standard synthetic bass-drum-set skin, as the diaphragm for his new drum. The ideas utility and low costs, spread the copied use of, for want of a better name, is the 'Trini bass', to now ubiquitous standard within the 'Rhythm Sections'. With this utility and low cost, they could now have, into the side, as many 'Trini bass's' as they could man. The 'Trini bass' underwent one further evolutionary adaptation, in particular the straddle model (now easily welded to a metal stand), where in this use, the synthetic skin has been replaced with locally available goat-skin, to render a considered deeper resonating bass note. As fate would have it, the 'Trini bass' has now gone the full evolutionary circle. Many steelbands now include it as one of their rhythm instruments. Some TT 'Rhythm Sections' have now also expanded their sound and repertoire by the inclusion of 'brass'; trumpets, trombones and saxophones to provide calypso 'lavouis' passages, Marno Marclin style 12 bar jams, to their rhythmic renditions. Of recent excitement has been their inclusion of the popular brass 'lavouis' overlay from the 2014, Farmer Nappy calypso, Big People Party, into the sections repertoires. As with all things; steelbands come and go. An attempt is made here to track these steelbands. Go to the links on the TT BANDS Page as linked below. Note: The listed number of TT Panorama Steelbands is considered to be reasonably well reportd. However, the numbers listed in all other sections is provisional, subject to change; and is considered presently under-reported. We begin this brief run-through of the description of the Steelbands of Trinidad and Tobago with the 'Conventional' Steelbands. These are the more widely recognised of the steel drum bands in TT, than the Traditional steelbands (later called The Single Pan Bands [SPB's]) that mimic those of the past; and are very active, as with all others, at carnival time. In TT, we like to call them all, just steelbands. We will visit the formally called Traditional (SPB's) steelbands in more detail later, after sorting out a few odd TT things that we should first understand about the differences between these bands. Least unwarily offending the local customs of the steelbands; we do not call them steel drum bands, but rather, steelbands. The steel drum instruments are called steelpans; the steel drummers themselves are called pan players or pannists. The instruments are played with pansticks; the term 'mallets' consigned only to foreign music nerds; the 'iron' played with steel 'strikers'. Once these subtleties are understood, following the way of the steelbands of Trinidad and Tobago, is as enjoyable as the song of the bull-finch. There is always however, some exception to any rule. One example of this is the stance taken by the wonderful Trinidadian jazz musician Othello Molineaux. Molineaux, a steelband arranger and a soprano steeldrum player of some repute in international jazz circles, views the local term 'steelpan' with some reasoned disdain. Molineaux's stance, in his view of promoting the TT Pan cultural, is laudably intensely passionate if somewhat singular. "I don't know why you people here call it a 'pan'.." he said. "It is a steel drum, it is documented in all the literature as a steel drum. We, the players who have gone outside of Trinidad and Tobago, and have worked so hard to spread the 'word' and gain acceptance for this instrument; have marketed it as a steel drum. I am a steel drummer. Everyone out there knows it as a steel drum. When you call it a 'pan', no one understands you. Why do you insist on calling it a 'pan'? ; it undermines all our efforts!" Let us first say that the term 'Conventional' is a later description of the steelbands that first started out, a long time ago, as 'Traditional' steelbands. So when we visit the 'Conventional' steelbands we are visiting the steelbands from the other end of their history from where they started, we are getting the story backwards. One is tempted to say that that we are getting the story from the 'end' first; but 'end' is not a nice term to use here, as it implies a 'stopping' point, which is not the case here; and anyway, we would wish the steelbands to go on forever! So instead we say; when we visit the 'Conventional' steelbands, we are seeing the steelbands in as developed and matured a condition, that this art-form allows today. The problem is that TT has both Conventional and (formally the) Traditional (now SPB's) steelbands all over the place, but if you see any of them, you probably won't be able to tell the difference, because they all look, and nearly sound, the same. If you're not from Trinidad and Tobago (TT), then you'd be fooled. The reason is; that although they are different, the Traditional (SPB's) steelbands are cheating! Captain Glenford Sobers of the South Central Single Pan Band, New Age Trensetters, a band of mainly children and youthful family members, was instrumental in requesting a lean from Pan Trinbago to allow his merry youth band to hang their pans on racks. A request that was granted, and changed the way of the 'Pan Round the neck' steelbands. We return now to what 'Conventional' is supposed to mean in a general sense. 'Conventional' steelbands hang their steel drums (we will get into the local TT vernacular of "Pans" later) on stands; and the instruments they use are evolved steel drum instruments, of a design that began to get stabilised around the mid 1970's, and took to around the very early 2000's to be brought to some degree of standard conformity; a process that is still unfinished. This process began when a 'Pan in Schools' programme, under the purview of The TT Ministry of Education, whose initiators had decided, after some loose consultation with the steel drum makers (we call them 'tuners' here), documented a sort of 'standard', then proceeded to overloaded the local steel drum makers with requests for new drums, to 'that standard'. There were rather a lot of 'selected' schools that they needed drums for; from a base starting list of 480 schools in Trinidad alone, together with an unnoted number from Tobago. The project was hugely ambitious, and was later down-sized to '10's' of schools. Despite the lesser numbers, the 'tuners' could not make sufficient drums to complete the order, in a timely manor, and the 'Pan in Schools' people had to borrow sets of drums from various steelbands to make up the shortfall and to meet their time deadlines. After the dust had settled, the result was that all the 'tuners' were now making drums mostly to 'that standard'. The steel drums that are used by the 'Conventional' steelbands today, are mostly now also to 'that standard'. Now what happened with the Traditional (SPB's) steelbands? To start with, the Traditional (SPB's) bands use standard Tenor drums in the hi-range (although they shouldn't), but older models of drums in the mid-range, are driven by the need to use 'single' pans across the range of voices, because they are supposed to 'hang the drums around their neck' ("pan" round the neck) in the traditional 'old way'. As an aside, it also means that they do not use any of the double-drums instruments, or higher number type instruments familiar to the 'Conventional' bands. So no Double-Tenors, Double-Seconds, Double Guitars, 2-3-4-Cellos etc. ; and they use only 'one' 'dud-dup' bass per player. Well now, so they are different? Well, not quite yet, for the reasons that follow. As time passed, and the seasonal competitions came and went, traditions were pressed when younger, less hard-nosed players, wished to join the bands. Then it was children; who found the drums to heave to carry 'round the neck'. So they asked Pan Trinbago for dispensations to put their drums (How I want to use the word 'pans'!) on stands; and got it. With little incentive to revert to 'round the neck' again; they effectively ended up cheating! And most Traditional (SPB's) steelbands now look like 'Conventional' steelbands, with all their drums on stands or racks when they perform. So unless you can tell or notice the difference, you can be fooled. So where does that leave us? It leaves us with the realisation that the Traditional (SPB's) steelbands of TT are no longer as traditional as they ought to be; and although they got a name change to Single Pan Bands (SPB's), about which we will see later; as they stand, there are only a few of the real Traditional SPB's left, and the traditions are slipping. Some depth to these details are briefly addressed in the Traditional Steelbands (SPB's) section. Returning to the 'Conventional' steelbands; we realise now that the 'Conventional' steelbands, paving new grounds in expression of musical steel, follow on from the musical roots of the real Traditional or Old Time steelbands; that they hang their pans on stands; but evolved with multi-drum instruments to become what they are today. Let's explore them a bit more (and this time, without the 'parenthesis''). It is humbling to realise; after the great war and up to about 1972, as the popularity for this curious music of steel spread through our islands, to the time when the steelbands became truly accepted as an indigenous national cultural art-form; when the energies of the genius of these under privileged, often uneducated groups of dedicated individuals whose preserve were these drums of steel, and who had finally proven their ambition with this musical dream; that these unique steelbands were playing their way into one of the most extraordinary and commendable footnotes of our nation's history. In giving this nation a strong heart of shiny musical steel; that matches in contrasting beauty the iridescent greens of the common unassuming humming bird, the label of our land; having pumped our universal, multicultural blood, scarlet as the common ibis, to a frenzy with their rhythmic melodic steel; they had inadvertently, by preoccupation with their art-form, preserved this nations same precious blood, from spilling uselessly on the streets in civil revolution. Although they nearly lost-it, by fighting among themselves in that period now romanticised as the earlies BACK. That period of unsettled territorial and rude-boy rivalry, also marked by accelerated innovation in the development of the steel pan instruments, their associated hardware and their music; the period between its genesis, around 1946, to the coming of stability, a few years after the issues and the bands were chastised by the sharp tongues and satirical voices of the public equalisers of TT, the calypsonians. Lord Blakie (Steelband Clash -1954), Lord Shorty (Cloke and Dagger - 1963), Lord Kitchener (The Bull - 1969), The Mighty Sparrow (Rope - 1972) are examples. They helped push the pan-culture forward to quiescence, by around 1972, when the earlies ended. The people were too preoccupied and distracted with their new music, and its conveyer, the carnival, to be bothered with serious political unrest. By the time they had awoken away from this preoccupation to the subtitles of new realities, these islands were already walking along a different path; on the shaky legs of an infant independent democratic nation, and the time of possible first crises, had passed. For our steelbands people, this is an honourable gift of historical fact. 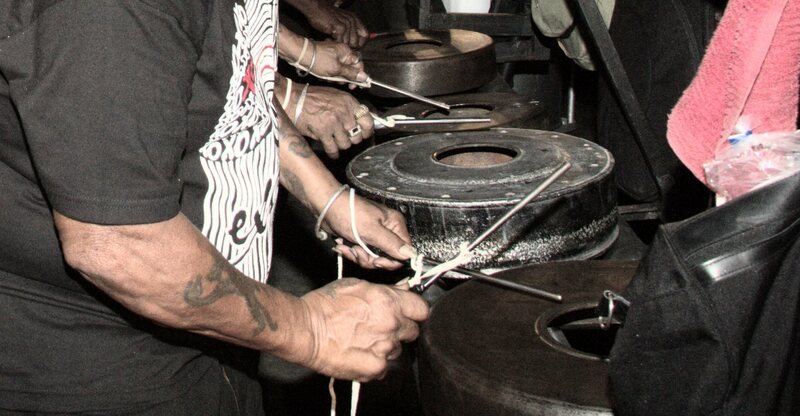 The conventional steelbands of Trinidad and Tobago can range in size from anything around 3 players, middling to about 15-20, to just over about 40. These ensembles are called the Stage Sides of the respective steelbands; the general every day performance groups. 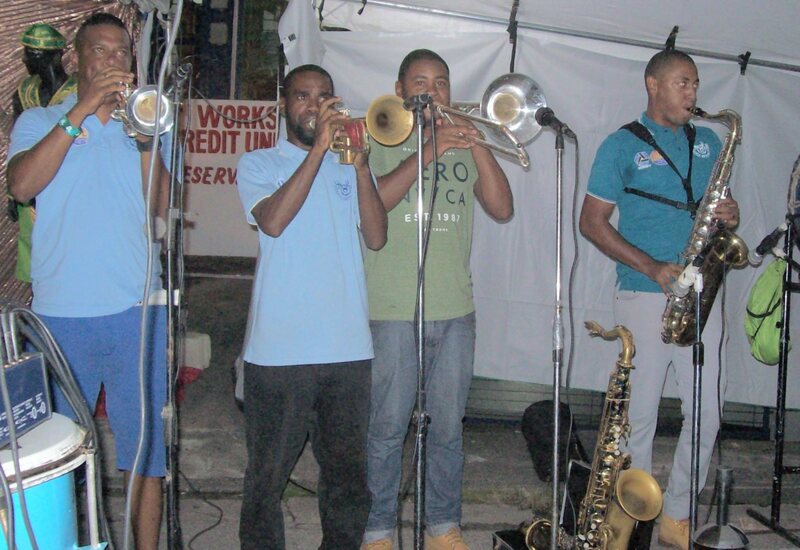 The bands size may vary according to the event, as a Pan in the 21st Century or a Steelband Music Festival competition may stipulate up to 50-60 players. The evolution of the TT National Steelband Panorama competition, over the years, saw a growth in numbers. The largest Panorama steelband ever to perform, was the record made in 1975, when the Maritime Life Hatters hit the Savannah's Grand Stand finals stage, to overhang it with bass racks (about these later), sporting 167 players (Under dispute; cf. Cavaliers); not surprisingly, they won. This precipitated a rule change, that for a time, set the upper limit to 100 members (New data 2016, Pan Trinbago SC [provisional];where the previously indicated number was 140 from an unconfirmed though not yet discredited source). One must note that these numbers account for all the members of the performing steelbands, regardless to which type of instrument they may be playing. In the late 1990's the figure was again adjusted to around 100-120 players; it now stands at a maximum of 120 (2016), for the Large conventional category steelbands. Each steel drummer plays on steel drum instruments, or steel pans, as they are called locally. Each member here plays 1 or 2 drums in the tenor range (Tenor, Double-Tenor, Double-Seconds); 2 to 4 drums in the mid-range (Double Guitar, 3-Cello, 4-Cello [or '4-Pan'], Quadrophonic), and some up from 4 (Tenor-bass, Hi-bass) to 6, 7 (Skiffle) or 9 drums in the bass (Low-bass) range. Not as commonly used, some 10 (Hatters, discontinued.) and 12 (Desperadoes, Harmonites, Scherzando; but may have been phased out of common use) drum bass sets exist. The steelbands collective harmonic range is about 5 octaves. 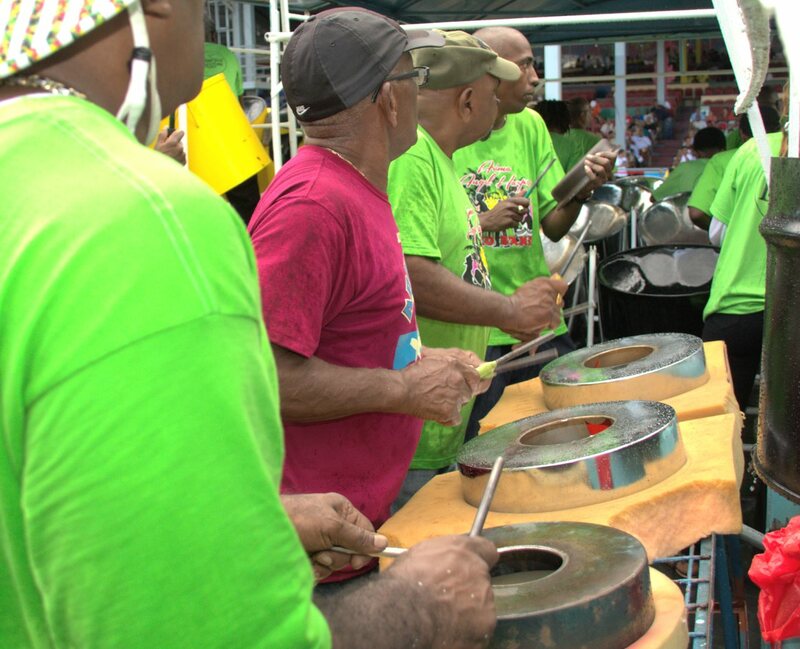 Steelbands have an accompanying rhythm section, affectionately known as the engine room, usually with a conventional drum kit, toc-toc, cow bells, scratchers and tumbas (a pair of congas) at least. Other additions are tambourines, chac-chacs or anything that makes rhythm; timbolitas being a later 'Stage Side' addition; and of course the ubiquitous iron. You MUST have Iron - traditionally scrapped brake drums of cars and trucks; latterly, variously moulded pressed components of heavy electrical-conduit fittings; all played with metal rods, the strikers, ~ 1 to 3 players, or 4 for a large Panorama steelband; this is the Iron section. The engine rooms collective harmonic range can rise to about deafening! For Carnival and Panorama, where the bands have to be mobile or on the road, the entire collection of instruments, WITH PLAYERS, are supported on hazardous wheeled metal structures with planked floors and light metal or plastic canopies, called 'pan racks'. Each structure comprising (sectioned by instrument type) 1 for the bass to as many 6 to 12 players for some mixed tenor racks. All of which is man-handled, by an army of loyal supporters, to propel them on their way. Some bands, for the carnival road, Point Fortin Borough Day and other 'rolling' festive events, are carried in covered structures on the back of a flat bed lorry, or have constructed a custom big-float, or renovated an ancient bus for the purpose; all pulled by a farm-all or tractor, or other heavy duty vehicle. The evolution to proliferation of the steelbands custom big-float's brought on a bit of an unexpected cultural clash as the islands of TT paddled forward to meet the perceived necessities of the 21st Century. The Ministry of Transport's Motor Vehicle Insurance [Third Party Act] amendment [Act 38, Chapter 48:51] crept unnoticed into the statute books in 1996. It took a few years for the strong arm of the law, the police, to realise it was there; and a few more before a bright spark within realised that it also applied to the steelbands big-float's. The crises arose when an audio impaired Pan Trinbago, the TT steelbands governing body, only 'heard' the news some short weeks before carnival 1999. The news was bad, very bad. There then existed no mechanism by which the steelbands big-float's could be properly licensed, provided insurance, and acquire the necessary carnival permissions documentation to be on the road, in time for the carnival; as 'all of a sudden' required by the strong arm. The steelbandsmen protested loudly and fitfully but in vain. No 'Proclamation of Carnival amendment for exemptions 1999' statement was issued by the TT nations President; the only person in TT vested with the legal authority to make a timely 'Proclamation of exemption' that could stick. Carnival is carnival, and pressing their luck at J'Ourvet, it is recorded that Hatters, and a steelband from Arima, got locked-up and their instruments impounded, for a short while; but were charged nevertheless. 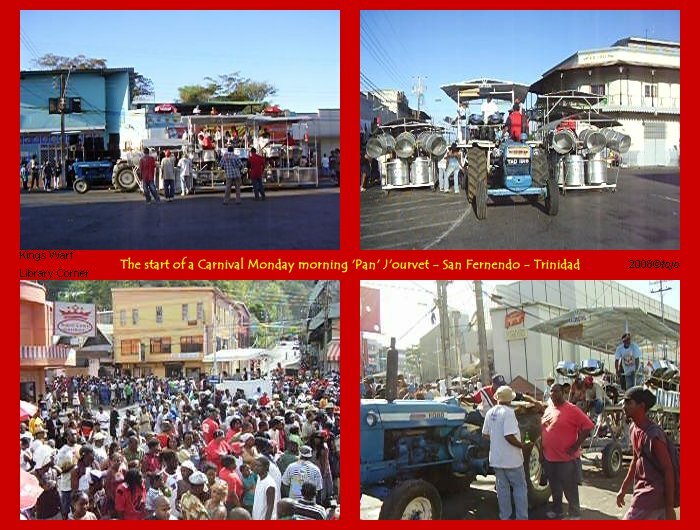 There were no big-float's on the road for carnival 1999. The big-float's insurance saga took about another two years to be settled across all the relevant steelbands of TT. Welding chassis numbers to custom floats with modifications for breaking and lighting, weighing and measuring for licensing, acquiring number plates, negotiating acceptable insurance rates, finding funds, and placing procedures in place to issue and recognise correct documentation; all took a while to do. Amusingly, at the end of it all, the steelbands big-float's were issued the special license number X, that proceeds the alpha characters on their 'number plates'. The roots of the real traditional steelbands lay at the very heart of the birth of the steelbands in Trinidad. These were formed by the craftsmen and musicians who had experienced the tamboo bamboo, and the later intermediate, cooking-oil and biscuit tin percussive phase, of the moving street music in the carnivals of the 1930's. By 1946, they were now going to be the beneficiaries of the demonstrated working models and copies of an idea and new invention, attributed to Winston "Spree" Simon, the 'contentious' father of the steel drum. The harmonically melodic steelbands we see today are a very different entity from the purely rhythmic monotonic 'steel' bands of the late 1930's. Those early percussive ensembles, with their square cooking-oil tins, large round biscuit tins, paint cans and an assortment of other items of a percussive nature that they would shake or beat, including pieces of metal; brought the idea of 'steel' into the terminology for the music of, whom the Colonial authorities of the day would consider, the underclasses. It is noted from this period that some of these rhythmic ensembles or 'steel' bands included bugles in their line-up, interjecting musical sentences into their presentations; much in mimic of the military band style. The invention and addition of the melodic drum instrument, historically recognised only from the late mid 1940's and onwards, due to the documented references made to "Spree" Simon at the carnival of 1946, demarks the 'start' of the 'melodic' steel drum bands. With the first melodic instruments, made from small round caustic-soda steel drums, and with as few as 4 'notes', did the idea of the first 'steelband' arrive. It would take to the first post war (WW2) carnival of 1946, where bands began to add the unusual musical 'pans' to their rhythmic, near musical ensembles of biscuit tins and bugles, that the 'steelbands' were truly borne. The steelbands owe their presence to the turbulent and often violent, but misunderstood, reaction of a determined underclass to develop, express and enjoy a new musical art-form. The steelbands, with their stigmatised adherents, were at first despised and at times suppressed, by the Colonial authorities of that era. To get in on the act however, required ingenuity, experimentation and hard work. The raw material for the first "pans" were indeed pans and biscuit tins. It is this early association with the steel drums development, that is now enshrined in our local vernacular, to call it a "pan". The vital transition to a multi-note melodic instrument came with the manipulation of the 'dustbin', which could have been made from galvanised containers, paint tins, open drums of any kind, to the much sought after discarded caustic soda drums. These drums, together with the larger oil drums, among others, were available but not that easy to get. And once you got them, either by bargain or more usually by theft, you had to now learn how to craft them into an instrument. It has been later noted (Trumpler) that any attempt to use galvanise coated drums, which includes buckets, to make a "pan" instrument would have failed. Although the underlying steel was suitable material; the coating of galvanise is too thick, and difficult to remove (requiring an acid bath process; not readily available, difficult to control and generally impractical); the note would not 'ring'. When burnt in a fire, as became the customary process of the panmaker "tuners", the lead and zinc constituents of the galvanise amalgam would have oxidised to a dirty yellow-brown-white film, requiring heavy cleaning, but still leaving too much galvanise coating for a good 'note' sound. So these newly invented primitive steel drum instruments, late of the 1930's, had to be adapted to move with the crowd, and be played, "on the road". This was accomplished by fitting a strap to the sides of the drum, and hanging it from around the back of their neck. These were the first members of the Old Time steelbands or Traditional steelbands, as they are now called. Where the onset of war (WWII: 1939) saw the banning of carnival and the restrictions of the street parades; the ambitions of these steelpan craftsmen and musicians, more likely took a turn for the better, although this was unrealised at that time. Where the instruments have evolved tremendously since that time, and their harmonic ability much improved, the method of carrying the steel drum remains the same. The members each carry 'one' steel drum instrument each and they use only 'one' 'dud-dup' bass per player; these are the - "pan" round the neck - steelbands. The tenor range is similar to that for conventional bands but the resulting bass sound, and bass percussive complexity, is more limited. The rhythm section comprises, for each player, a single drum, African or Indian in origin, supported by a strap. There are all the other familiar hand carried percussive instruments; and "iron" of course. The size of these bands ranges from a minimum of 2 to 3 members, to the middling 10 to 20 players, for the every-day 'Stage Side', to 45 for the Panorama steelbands. As explained before, The Traditional Steelbands (The old name for the Single Pan Steel Bands - See below) of Trinidad and Tobago are cheating!. Despite this comment, and before a more detailed description of them is given, the next reasonable thing to say about them is that; they do exist. This may appear at first a trivial and out of place comment, but in the following context, it is not. This then leads to the next question, which is a double one; How come Traditional steelbands exist, when we already have conventional steelbands? And, where did they come from? These queries arise for the simple reason that the Traditional steelbands of TT, much like their conventional counterparts; are newly evolved steelbands, and are not 'Traditional', in the real sense, at all. Before moving on to attempt to answer these last questions, we observe that one characteristic that defines the Traditional steelbands (Old name) of today is that they are 'pan round the neck' steelbands. This designation was change when, in the middle of 1998, the Pan Trinbago 'think tank' changed the naming of the Traditional (pan round the neck) steelband category, an awkward term, to the currently used Single Pan Steelband (SPB) designation. The new designation was first used in the Steelband Music Festival 1998, PAN Is Beautiful IX, that started on the 16th October that year. 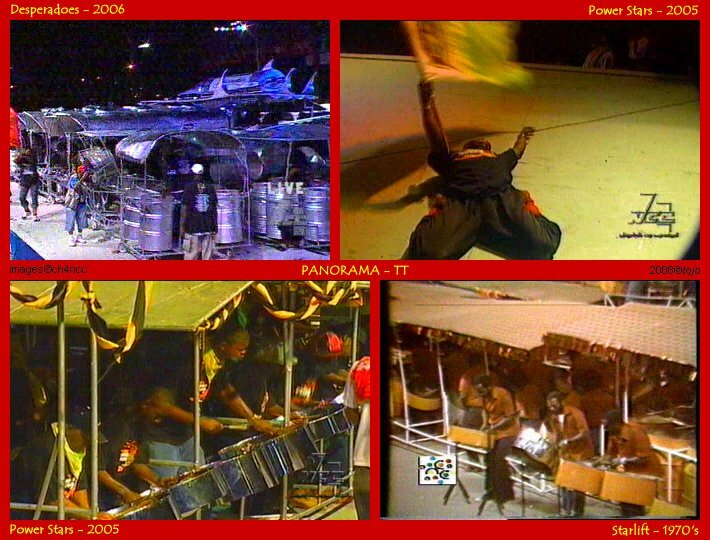 On the Panorama stage, the name The Panorama Single Pan Steelband competition, first appeared for season 1999. Statistics for the Single Pan Steelbands of Trinidad and Tobago reveal that, as of 2004, the stipulated size for Panorama performances range is [25 to 45*] in size. These limits remain to the present time (post-carnival 2016). The * just indicates that the maximum includes the count of ALL instrument players; not just pan-players alone. As a reference point; the number of performing SPB's for 2004 was, 54. Ten years later, in 2014, the number had risen to 63; with an extra registered, no-show, of 3 bands. Showing an increase in performing bands of 17% (9) over the past decade. We now return to those questions, posed above, as to the origins for the Single Pan (formally Traditional) Steelbands of TT. We take the last question first: Where did they come from? That has the rather straight forward answer in that; they began as representatives of the Old Time 'pan round the neck' type steelbands. 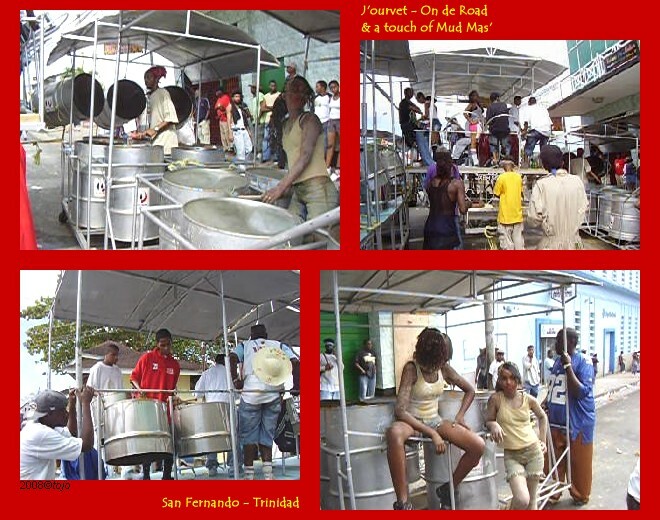 These were examples of the type of the first 'melodic' steelbands to arise in Trinidad, and had one pan per player. The Single Pan Steelbands (SPB's) then went on, on a generic line of their own, as a representative of the 'Traditional' idea; but evolved their own new instruments on the way, to become the bands we know today. So then, when did that start? Here we come to answer that, with the first of those questions that was posed above: How come SPB's (formally Traditional) steelbands exist, when we already have conventional steelbands? This is because of the way Panorama was running at the time. 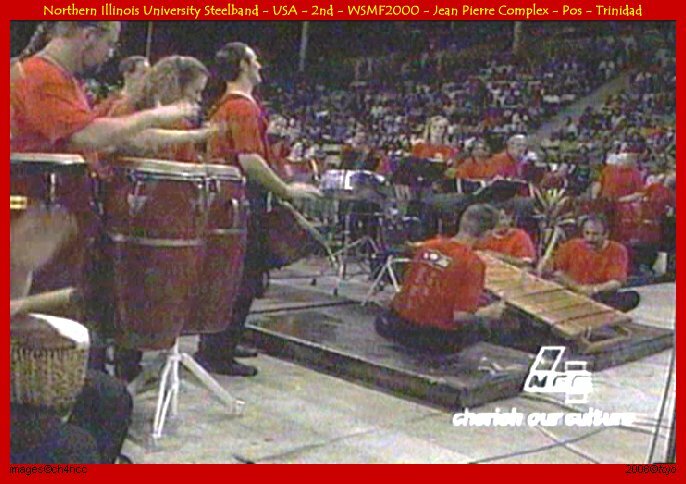 We need recall that those early Panoramas were effectively a long queue of around 100 steelbands in competition, out of which some 12 to 16 would end up in the finals. There were no categories of any sort; as recognised today. A recent source has revealed that; a spin-off steelband from ESSO Tripoli of EXPO 1967 Canada fame, calling themselves The Tripolians, a band from the 'East' (as they were traditionally called; now classified as a 'North' band) (most likely the early St James Tripolians SPB that we hear performing today) registered themselves to play in Panorama, and appeared as a 'Pan round the neck' steelband; the first to do so at these competitions. That was Panorama 1969. They were followed shortly by (among others) Hoytonians of the South; who later split to form Skiffle Bunch of the South in 1977, who themselves rose to dominate the Traditional (SPB) category with 8 wins before changing into a conventional steelband in 1993. Although we have no confirmed date (at this time) for the start of the separate Panorama Traditional 'pan round the neck' category; we can only infer that it started before 1977. But from this we note that; the Single Pan Steelbands (formally Traditional) [renamed in 1999] are a Panorama creation; and evolved in their own right, to the present, along their own separate path. In the high range; Tenor (the standard as used by all bands); 2nd Pan (an Old Traditional band pan), Harmony Pan (~ 16 notes; a new type pan specifically developed for the SPB's). In the mid range: Piggy Pan (8 notes; non-chromatic [Diatonic], an Old Traditional band pan that in now replaced with the following pan), Guitar pan (a different note style pan specifically developed for the SPB's; chromatic). In the bass range: Hi dud-dup (12" to 15" diameter [Small] whitewash-can type pan), Low dud-dup (type 1: standard 45 gal drum; 5 notes), Low dud-dup (type 2: standard 45 gal drum; 2 notes; tuned 'dead' for dud-dup grumble bass sound). Lloyd Gay reflects, in a similar vein to the thoughts of the author, that the SPB's have diverged away from the Old Time 'sound' with their new instruments. As with others who have commented on the topic, the sentiment is that the SPB's should be realigned, possibly by regulation, to reproduce the Old Traditional 'sound' by using pans made in the old style tradition, i.e. without benefit to higher 'partial' tuning; then they would return to be 'Traditional' bands, more than they are now. For anyone who is not familiar with the 'sound' of 'Old Pans', there is that wonderful piece put together by the explorer arranger Andy Narell, one of our closest brother-arrangers out of New York, with decades of work in Trinidad, who is reputed to be the world's foremost collector of hi 'old pans'. Andy's Down de Road (Old time calypso) is played on sets of 'Old type' and tuned steelpans, and is a must listen; with an infectious true old ping-pong tenor lead, sweet piggy-pan background strumming and some classic backing syncopation which includes the sound of some good 'bottle', from that 'bottle and spoon' era. I can't account for the 'spoon' bit here, because I don't know if anyone remember to 'tief granny spoon to bring it to the session! TT Defence Force, NT, is strictured, by its military institutional origins, to be disciplined and correct. It is one of the top TT SPB's, and perhaps most travelled, and has had the unique stage of playing at the Glasgow Military Tatoo in Scotland. At home, it remains one of the best, vying at the top in competition, but with the distinction of always looking like a typical 'pan round the neck' steelband. La Horquetta Pan Groove, ET, a multiple SPB Panorama winner with arranger Duvonne Stewart, were an outstanding and just plain, the most dangerous thing around (well, that was until they moved across to become a Small conventional steelband in 2014). Running completely off the rails, Scrunters Pan Groove, NT, has no particular outstanding quality, other than being a solid and entertaining steelband, but I love this steelband. Why? I don't know. It's probably because of it's name, which is a typical rendition of TT; but its members are a wonderful group of people. The SPB with the closest 'sound' to the Old Traditional bands is Kings Row Retro Riddum, SC, because they have purposely chosen to highlight the old style pans. But the band which best represents the old tradition, considered by many as the last original Traditional Steelband of TT, managed by 'Rasta' Captain and arranger Jessy Lessy, often misunderstood because of his isolation living in the 'country', Point Fortin; who is a farmer, is highly respected in the community, and although irascible at times, is known as a 'fair and just man'; is the family SPB, the one and only Jah Roots. And there we end. We summarise by stating that The Single Pan Steelbands of today (2016), are a facet of the Panorama competitions; but sadly note that they are considered secondary to the Conventional steelbands in importance; despite rendering excellent and exciting music. This cultural perception remains sadly out of place. The Tinpan is a musical instrument originally made from discarded tin-coated steel food cans, of volume of about 16oz (454 gms) or larger. The original model of the prototype steelpan may in fact have been a tinpan, but the certainty of this fact, is at the moment lost to history. What has been noted however, is that a prototype steelpan has been found, which was made from a cut-down 'caustic soda' steel drum, of size about 10 to 14 gallons (0.045.5 to 0.063.6 m2), onto the 'top' of which had been indented, 4 'tuned' musical notes. The point being made here, is that although the tinpan and the steelpan are 'similar' types of musical instruments, using a vibrating metal surface to produce a musical note; they should be classed as two different types of individual musical instruments. We now rephrase the above facts in a different way, to arrive at an understanding of the relationship between the tinpan and the steelpan. It's the 'chicken and egg argument'; which instrument arose first, the tinpan or the steelpan? Whereas it is appealing to consider that the tinpan is the precursor to the steelpan, there is sufficient anecdotal historic evidence to suggest otherwise, and it was the steelpan that is in fact the precursor to the tinpan. The relationship is strengthened by the observation that after the appearance of the limited note steelpan, the evolutionary trend was to develop a single instrument with more notes, using larger drums or pans. When the 'tuners' arrived at the largest, and most economically accessible steel drum available, the ubiquitous ~ 45 gallon (0.2 m2) industrial steel drum, expansion of the instrument size essentially halted. It was also about the upper limit in size for an instrument to be carried, and had sufficient surface area onto which a useful range on musical notes could be designed. And further, in that initial short pioneering era, the early steelbands required only a 'tenor' steelpan, and that ubiquitous ~ 45 gallon steel drum would ideally do that job. The desire to get 'more notes' on the pan was accomplished by 'sinking' the sheet metal of the skin 'deeper' into the drum, thus increasing the usable surface area. Experiments with adjusting physical 'note' shape and size, would self-conspire to set the upper limit of usable notes on a 'Trinidad tenor' pan. Anthony Williams 'spider pan' was such an experiment; and his eventual '4ths' and '5ths' pan marked the end of the evolutionary line for the standard 45 gallon 'Trinidad tenor' steel drum instrument. Any larger, over-sized drums, would be future, more costly, technological hybrids; with specifications far outside of the requirements of that early pioneering era. As an aside, returning to that early pioneering era; using the ubiquitous ~ 45 gallon steel drum as stock; the requirement of finding new instrument 'voices' with musical notes lower than 'tenor', which were progresses physically larger on the steel, drove pan evolution in the direction of multi-drum instruments. More drums were needed to cover a larger 'range' of notes; with the largest collection of drums comprising the 'bass' voice instruments. In none of this early steelpan and steelband evolution do we see any 'tinpans' appearing in the mix. The first 'best guess' appearance of the 'tinpans' is placed somewhere between the late 1950's, and most definitely to have evolved shortly after Panorama in 1963. We must make note of one further odd thing; during that period the public of TT would 'hear pan' from only two radio sources; Radio Trinidad and Radio Guardian. Television only arrived at TT Independence, for it's first broadcast on 31st August 1962 for the parliamentary event of change-over in rule and flag raising, transmitted by TTT (Trinidad and Tobago Television); the only available TV channel for a couple of decades. It was through this media that the public first became aware of tinpan. Via a program called 'Uncle Bobb and Auntie Kay' (Radio or TV? researching as this impacts on the dating; but eventually also on TV) , within a segment named 'Scouting For Talent', there would appear the odd young talented musician soloing on a 'tinpan' array. It should be also realised that this period marks the time when the 'steelband' began to rise in popularity, and culturally resonate, with the general public; and within the ranks of its practicing adherents in particular, was becoming a 'fad' or 'brand' (as we could call it today) of upward 'social' attainment. This 'brand' identity would surprisingly maintain itself all the way to the turn of the millennium, when outside cultural influences and distracting imported electronic technologies together, brought in the infection of the predicted 'Pan in Danger' virus that is presently decimating the socio-cultural 'brand' steelband. But it was in that early time when the 'brand' was establishing itself, that the youth of the ranks of its practicing adherents wanted to get involved. It was this youth, with that need, that invented the tinpan. It was from this close community of youth, who could not themselves afford a steelpan, who would group together to form the tinpan bands. We need also realise the difficulty they would face, in those early days, in obtaining a real steelpan. It was not necessarily the cost of the steelpan that was to be the hurdle, although to be sure it was comparably high; it was their scarcity. Each steelpan that was made was 'precious' because of the scarcity of drums and 'tuners', and were all destined to feed the hungry need of the growing number of 'organised' steelbands. Noted before, the tinpan is a mimic of the steelpan. But a single tinpan does not an instrument make, or not quite. What we need further appreciate, is that it is the physic of sound that determines the physical 'size' of a 'pan' note in the perceived audio spectrum. In that medium 'soprano' and 'tenor' range of usable tinpan 'notes', it just so happens that some tin-sizes can support up to 4 notes on the top of the tin. What is needed is a collection of tinpans, that can make up a range of usable notes, preferably but not immediately necessarily in chromatic order, to make up what can be called a 'tinpan pan'. What is also needed, to accommodate notes of a lower pitch, which are proportionately larger, is an assortment of tins of various sizes; some sufficiently large to accommodate the larger lower pitched notes. Here follows a relevant note on providence. TT were fortunate islands at that period of their post war (WWII) history, particularly the island of Trinidad. Trinidad was still a major sugar producer in the Caribbean, had a viable and operating citrus industry and her established oil industry had just about peaked at being the Americas regions 5th largest oil producer. Fortunate in trickle-down, the under privileged were not in poverty, and there was a growing middle class. The WHO had advised that powdered milk was good for the health of developing economies, although the manufacturers would over-spin the benefits; the TT economy and food infrastructure was however in good enough shape to import these items, and much else, in quantity. All in all, this meant that TT had an incredibly wide range of available tin cans, with which to make tinpans, to choose from. Apart from the ready availability of general sized tins; the tins of choice for the tinpan makers reduced to three verities. From the citrus growers, the larger sized grapefruit tins, over the smaller orange juice tins, were preferred. From the oil industry, the motor oil tins of 'quarts' and 'half gallons', supplied in those days by ESSO and Shell, and later Texaco, were the norm. From the groceries came the powdered milk tins, of the local market leaders Klim and Fernleaf, making up the last set. Of the youth of that era who experimented with making 'tinpan pans'; it is noted from the South of Trinidad that the accomplished pan tuner Lloyd Gay and winning Panorama arranger Steive Achaiba, started their careers by making 'tinpan pans'. A few, names unrecorded at this time, had a gift and a talent, would practice enough to be able to take their wire basket or boxful of tinpans to play at a friends party, a local event or to appear briefly in the limelight at a 'Scouting for Talent'. Tinpan bands are comparatively rare because the 'youth' that comprised them had to qualify a few loose socio-economic parameters. They were closely related, either in direct blood relation or in close proximity, to the people who supported or played in the steelbands; the people that history tells us were from a stressed socio-economic background; this would make the group enthusiastic about pan. Further, there had to be a close community from which their numbers could easily be drawn, otherwise it would all fall apart; this would indicate high density population areas. In fact all this points to specific communities of excess population; government housing schemes and the 'squats', the latter housing not only the migrated local economic opportunists, but also some illegal immigrant populations. So in summary; tinpan bands are rare, usually formed by enthusiastic youth from a close community, who catch the 'fad' to form a band, make their instruments themselves, practice and perform together for a season or two, and then disband; as they move on to the other necessities of life. The Klim Fern Gettonetts of Mc Sween Street, and New Jammer(s) of Roy Joseph Street, are both from the Roy Joseph Scheme, San Fernando. They arose in 1972 to 1973; and even managed to have a Tinpan 'Panorama shootout' between themselves, in the Roy Joseph Scheme, for carnival 1973. The Klim Kids of of Taporite Street, Morvant; (undated) turn out to have been a Raymond family ensemble. The XY Cellotones Juice Tinpan Band (unknown location, undated; researching) ; indicates that the 'XY' in the name refers to 'style' of 'notes' grooved into the top of their tinpans; having a mix of 'X' (4 notes) or 'Y' (3 notes) in design. We also acknowledge the help of Dr Jeannine Remy, DCFA, UWI. IRON, Iron, Iron, Iron, Iron, Iron. Iron is the fusion energy source of the steelbands engine room. Iron; brake drums of scrapped cars or trucks, cut bits of C beams or any handy piece of steel; but mostly brake drums, because of their shape, size and 'sweetness' of sound. Iron is played with short steel (metal) rods called 'strikers'. It can be carried singly, for one hand playing "on the road" or mounted in a stand (also mobile!) for two handed playing. However your iron is presented, you begin to have an Iron section in your engine room when you have two or more players; Iron men. Without the slightest hint of sexism implied; an Iron woman is by definition an Iron man. You have no steelband unless you have Iron. A steelband without Iron is unthinkable. 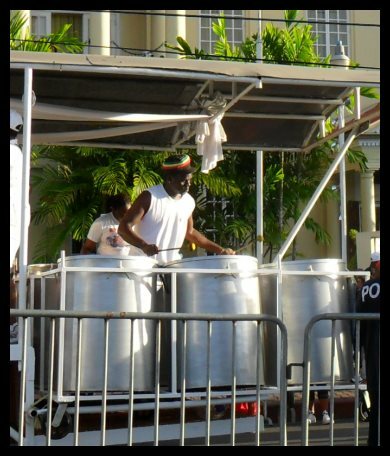 Steelbands and Iron are as synonymous as steelbands and corn-soup, shark and bake, pees and rice, crab and dumplin, curry-goat and roti, souse and black-pudding, doubles and runnins, bush-rum and headache. Steelbands and Iron have a marriage of consent that is so sweet, so inseparable, that it is blessed by every God that man has ever conceived to imagine on this planet. The colour of sound from a brake drum is just right for Iron. It tinkles, it zingles, just with the right pitch. When the Iron men play their complex, in and out of phase, off-beat syncopations; it is a shower of sound that reaches around you. It grows to call you, to secretly invade you brain. You get locked into the beat, you twitch in sync, your feet behave as strangers until you understand they are yours and you must follow their steps, step, step. Ting-a-ling, step, step, step. Ting-a-ling, step, step, step. Oh-Yoooooo! step, step, step. Yes, it will never, ever, let you go! Being an Iron man is a position of great responsibility within a steelband. A good Iron man holds tremendous respect from all. The question of whether to be or not to be an Iron man never really arises. Either you have failed, or youre an Iron man. The Iron holds the timing and spins the engine. Without detraction to the desired efforts of the team who make up the rest of the engine room, Iron men are something special. In its own right; their rhythm is a counter-weaving art-form of sound. The height of the art-form is 'cutting'. Within a group of ironmen is one 'cutter'. The 'cutter' brings the 'off'; that beat in the gap of the phrase, that taps in 'time' but is 'off' a quarter, a half, a sixteenth. It rises in volume at the 'right' time, and fades to disappearance, to return again to emphasize 'that part' of the tune. An Iron man requires an innate dexterity; an affection for steel that is close to an affliction; a constitution that does not recognise boredom or thresholds of pain; an unerring sense of timing; a stamina that is almost inhuman. Tradition has it that once a band is moving "on the road", the Iron never stops! The Iron strikers of Republic Bank Exodus (Large) with shoe-lace safty ties; in case you drop one. An example of a badly kept, rusty, silver painted, 'iron'. There is nothing shameful about owning a silver painted 'iron'; most 'irons' in TT, and some very 'sweet' ones at that, are of this variety. 'Sweet' being the local TT vernacular reserved for some few 'irons' of a particularly pleasing ringing tone, or timbered voice; a rare and particularly prized instrument. But 'irons'; usually made from general, non-stainless, steels; need care. Their surfaces should be regularly cleaned after use, and they should be stored in a dry place. Many 'iron-men' carry their cherished instruments around in custom made canvas/denim bags. The dull brown colour of a rusty 'iron' is shown in this example. It is an affront and a disgrace. It is that sadly typical disrespect shown to a 'low-life' instrument; one stored in the back of the shed, with no care, and then to be brought out in a 'hurry', to make up the 'side'. 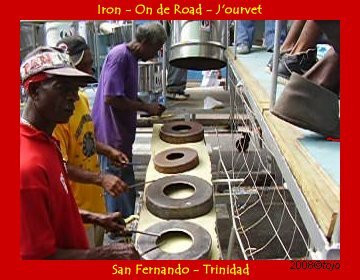 The source will however remain un-named; but please, please, care for your lovely 'irons'; like the Sound Specialists of Laventille 'iron' shown below. 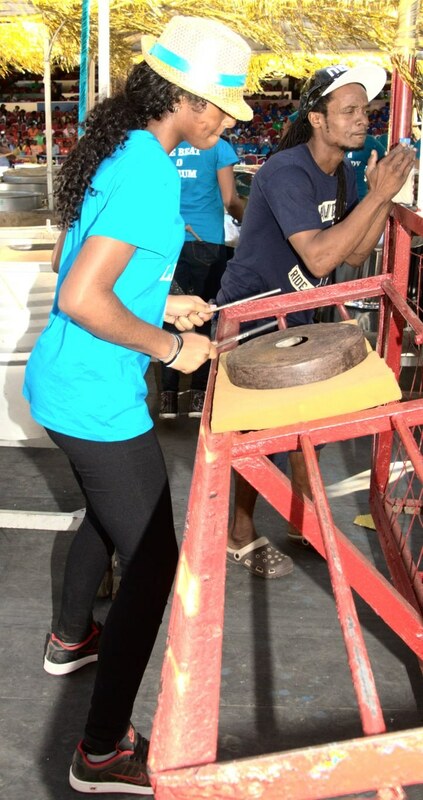 The fashionably 'chromed' iron of the Courts Sound Specialists of Laventille is a good example and tells an unusual story, in process metallurgy; about which the chromed steelpan owners, mainly the steelbands themselves, are largely unaware. The 'iron' of Sound Specialists shows an aged, heavily used, but actually well cared for 'chromed iron'. Its surface is clean, and the side of the face towards us, and the face most struck by the steel strikers, shows the dull brown colour of sweat oxidised cleaned iron, rather than the light brown tone of rust. The 'gold' has a light sheen and the chrome is mirror bright. The story is in the 'gold' and the absence of the 'chrome' from the face of this once completely 'chromed' instrument. Starting with the element chromium, it has some amiable and useful properties in being, although slightly protectively oxidised, a metal that can be brought to a silvery sheen with a light polishing and will hold the sheen, and not tarnish easily. Chromium has a larger atom than the element iron, and when mixed with it, in around an 11% to about 30% mix of chromium, and with some other things, turns iron into an incredible range of 'stainless steels'; the tough and strong 'rust proof' metal found in common cutlery and favoured as the material out of which the iron 'strikers' are made. Chromium's other useful but difficult property is that it is hard and extremely brittle; the property that makes it a durable, yet delicate, coating material; the thicker, the more durable. The chromium atom is too large to easily stick to iron. To get over this, an intermediate coating of an element with an atom smaller than chrome, yet larger than iron, is needed as an interface. This is that material with the 'gold' colour; nickel. Nickel, like chromium, does not tarnish easily; but unlike chromium, is as about as soft as iron and wares easily. In the process of electroplating a 'chromed' item; like a steelpan or an 'iron'; the iron item is first cleaned, then electro-coated with nickel; cleaned again; and then electro-coated with chromium; then washed and polished. Technical details of the processes of cleaning, rate of electroplating, purity of solvents and thickness of coatings, in the main; makes the final product a 'reasonable' or 'very well' chromed item. Any 'short cuts' applied here, can induce early cracking and 'peeling' of the chrome coating. If for example, an item is chromed without the intermediate layer of nickel; after a time, if a crack has formed, from a dent or a minute corrosive dust-spot; the chrome will easily peel away. The process of 'chroming' is an expensive business; in that the materials nickel and chromium are high cost elements; the area covered and thickness of coat, driving the cost; and the more attention paid to the intermediate cleaning processes; adding further to the cost. Somewhere between a third and half the cost of a chromed 'steelpan' is in the chroming; the larger the pans, the grater the cost. For the luxury of a chromed bass-set; about three-quarters of the cost will be chroming related. There are two main process plants in Trinidad and Tobago that provide the chroming services for most of the steelbands of these islands. Remaining nameless here and hopefully without bias; they provide the choice of affordable or expensive chroming; depending on the depth of the demanding pocket. Returning now to the 'chromed' iron of the Sound Specialists of Laventille; one may be tempted to claim that this was an 'affordable' chrome job; however one must be a little careful here. Chromed steelpans 'age' with micro-cracks from the vibrations of play, knocks of tuning, temperature variations and promoted by dust particles if not properly cleaned; and can 'peel' but survive under re-chroming; and are best kept in containers or separate cases. On the other hand, one of the 'worst' things that can happen to a chromed item, because of the brittleness of chromium, is to shock it. The face of an iron sees the 'worst' of this type of abuse; from the high impact forces of the strike itself and from the high frequency of the vibrational harmonics induced; cracking the chrome. This in turn, promoting the chromium to peel off, no matter how well it is seated; nickel or no-nickel. So the only reasonable answer here, which may have its own surprises; is to ask the owner of the Sound Specialists of Laventille 'iron'; where the job was done. When the Old Time steelbands (who were not Old Time then!) started up in the late 1930s early 1940s; the names of the bands, and recognising the bands by their name, was straightforward. Alexander Rag Time Band, Oval Boys, Casablanca as an example. All remained relatively simple until fashion, bad communications, geography and economics intervened. The fashion and bad communications go hand in hand with names like United and Angel Harps, and gets worse with geography for All Stars. And dont talk to me about Pan Groove! All the above names are the root names for the bands. Southern All Stars all over again - Oh well. All Stars, Trinidad All Stars, Catelli All Stars, Catelli Trinidad All Stars, Neil & Massey Trinidad All Stars an now Massey Trinidad All Stars. A cultural and sociological happenstance occurred when a progressive external systems cultural moors clashed with the conservative secular evangelism that pervades TT society. Gay Flamingos, who didn't even have to fly away. (Pan Am North Stars ~ 1963), although of enormous benefit to the steelbands who were chosen, engendered some disquiet among steelband aficionados who defended their affection for their names on the local grounds, and disliked the sponsors required prefix. Over time some bands developed such strong and amicable quid pro quo ties with their sponsors; that both appear with equal strength and respect, to appear almost inseparable, and are accepted as such. Examples of these are WITCO Desperadoes, AmoCo Renegades and Fernandez Vat 19 Fonclaire. The aficionados proved their point however when, for example, much to the delight of the sponsors, Catelli All Stars, Solo Harmonites and Carib Tokyo subsumed the tradition and nearly lost their identity by becoming known as Catelli, Solo and Carib respectively. But alas to Cavaliers; they got bogged down, and sank without trace, under that cool dark Irish froth of Guinness. The main lists on these pages always separate the sponsor from the root. Where necessary a regional split may also be made. All the sorting is then applied alphabetically to the resulting root names only. OK then, what about Pan Groove? Well I gave up, didnt I. I think it was a good back peddle, and hope to show why. But the Wonders of the Web allow me to change things easily, if necessary; so to that later. Humming Bird, Phase II and Redemption. There was no regional contention, generics dont count, and it was Phase II that settled it. Its this affection on the ground for the name that did it. Phase II Pan Groove, with all the rest, sits alphabetically dispersed on the right. For the Panorama competitions, Pan Trinbago has designated Competition Zones within specific geographic regions of Trinidad and Tobago. A bands panyard address locates it within its respective zone, and the band will begin its preliminary competition rounds, from the selected stadia within that zone. These competition zones and their competition stadia, are listed below. Every panwomans or panmans dream, is for their band to play at the TT National Steelband Panorama Competition and win. 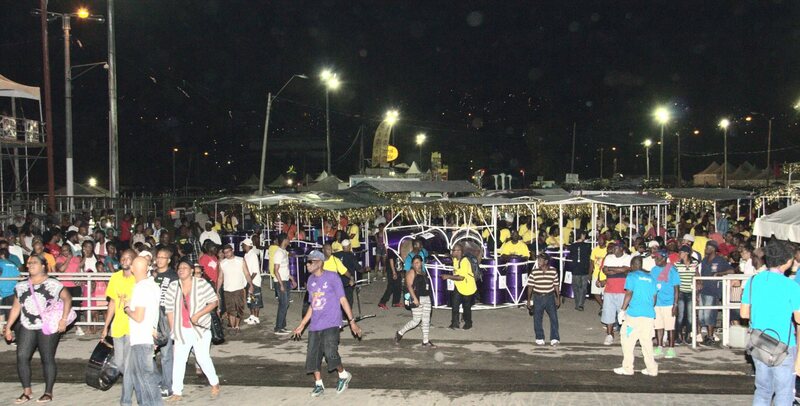 The Panorama Grand Finals, held each year, usually always on the Saturday prior to Carnival Monday, is the event that all 'pan' lovers never miss. This is the time that 'pan' people, stranded in foreign lands, have a sinking whole-body pang of homesickness. They can't turn on a radio to hear, or a TV to see, what is broadcast only on the local stations; or so it used to be. Today, the wonders of the internet, have closed that yearning gap; with Panorama streaming to all four corners of the planet, sadly constantly in military conflict, to raise their day. Moving off the barbergreen, CAL Invaders prepair to mount the stage for a mid-evening Large Steelband performance. The wizardry of the internet now impacts highly on the stage of Panorama. In TT, a land witlessly embroiled with mediocre and corrupt governance, yet conspicuously abundant in resource for the Caribbean, yet seemingly limitedly so on its own home ground, where some leakage of resources to as yet to be discovered tax havens, occurs along some hidden pipelines, designed to carry diesel no doubt; now sports internet connectivity; the equal to none in the Caribbean; or so they say from outside. This technological resource allows our National Panaroma to stream to the four corners of the planet, sadly constantly in military conflict, to raise their day, or so one should think. Additionally, interested local FM broadcasters, seeing the way forward, avidly connect to the net to feed the seasons Panorama renditions 'the short hop' to central-station, and then FM it about, and why not? They now stream it to all four corners of the planet, sadly constantly in military conflict, to raise their day. This would all work splendidly, were in not for the fact that; one-half of the over-spill from corrupt enterprise are happily at home, busy on Hi-Def, hi-fi, why-fi, downloading Bollywood Panorama and re-plays of Hollywood renditions of, sadly constant military conflict, from all four corners of the planet. Simultaneously; the other-half of the over-spill from corrupt enterprise are happily in and around the North stand, treating Panorama as the noise between intimacies; while they Hi-Def, hi-fi, why-fi, tweets in hash-tags, tex-sin and vex-sin the usual 'Why you eh reach yet'? as they race to out face-book one another with chat and pics of sadly recent conflicts in body-contact. Meanwhile, the interested local FM broadcasters, short on preparation, are now sweating it out in the middle of the internet traffic-jam, in serious trouble with 'the short hop', and FM-ing out 'Boogsie' missing in action, 'Smooth' like the gaps between sharks teeth, and the last six minutes, twenty two point seven two seven three seconds of a 'Pelham' 'where is the music?' rendition; now made useless for a 'you-tube' up-load to the general public; to make the point. PAN-O-RAMA (As of the original 1963 spell-logo) is an unusual, home grown, dual-component TT musical contest. Its sound is rendered by the peculiar pulsing and purring of the melodic metallic notes of vibrating steel of the steelpans, a sound to which the home TT populace have grown fondly accustomed, but which can at times overwhelm the audio sensitivity of an unwary visitor; until such time that they audio-learn to get the hang of it. The music is a 'symphony' about the 'spirit' of the rainbows of colour, of the dynamics in body movement, all intoxicated by the utterances of the songs of the people. The music is an interpretation of the lust of the populous as they unabashedly mix together to celebrate on the streets, their special own home grown festival, TT Carnival. The dual-component is a special traditional alliance-bond of trust between the 'highly revered wizardry' of the musical arranger and her/his contingent of mostly non-musician 'players'. Players that comprise the whole of the 'steelband' itself. The ambitions of the 'music maker' must be totally explored by the honed skills and engagement of the 'players' that comprise the ready 'steelband'; their quest for glory, depends on this. The dual-component continues into the contest; in that; can the ingenuity of the music composed by the 'arranger', invested with so much care by arduous practice into the magic hands and soul of the players that comprise the 'steelband'; be sufficiently eloquent in surprise of content on one hand; and can each note be performed with such fine exquisite technical precision on the other hand; so that by this composite effort, the opposition is blown wayward by this undoubtedly masterful musical performance. TT Panorama is an ultimate cultural expression; a TT musical magical mystery tour de force. With the recent advent of a 2004 Panorama format change for the Conventional Steelband category to now include Small, Medium and Large sized steelbands, the traditions have changed somewhat for the placement of the much anticipated Finals. 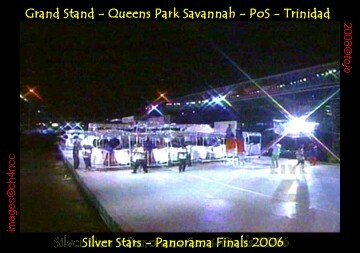 The Panorama Finals for the Single Pan Steelbands and the Small conventional steelbands being held together on the Thursday evening (before the grand finals) at Skinner Park, San Fernando; and the Panorama Grand Finals of the Medium and Large conventional steelbands, on the traditional Saturday evening, carnival weekend, at the Grand Stand, Queens Park Savannah, Port of Spain in Trinidad. The Panorama Steelband Competition, initiated in 1963; was not the first steelband competition to be organised, nor is it the only steelband competition held in these islands, but it became and is, the Premiere steelband event of the year. As Trinidad gained Independence on August 31st 1962, the Nations first Prime Minister, the inimitable Dr 'Doc' Eric Williams who was steadfastly and conspicuously fond of cultural events and their promotion, (He was also steadfastly and conspicuously fond of Broadway Extra cigarettes that finally keeled him over), was probably instrumental, together with his government, in sponsoring a National Steelband Competition to mobilise and inspire a musical resource of such obvious abundance and talent but was stuck to the carnival "road", with no other purpose on which to focus. So as a matter of no little National prestige, Pan-O-Rama came to fruition in the year following a newly Independent and celebrating nation. Panorama flourished and remains. Its impetus and success has no doubt had incalculable beneficial effects for the steelbands, their promotion and for the world-wide recognition of this TT art-form. We pause here for a historical note that cautions us with respect to the calculation applied for the number of years that have passed since the start of Panorama in 1963; and to the number of Panoramas that have actually occurred within that period. In 1979 there was NO Panorama (actually only a Northern preliminary); so post-1979, there is always 1 less Panorama, than the count of the number of years that have past. Post TT Independence of 1962; the PANORAMA of today was derived from three independent National steelband competitions. In 1963, billed as the Best Road March Steelband Competition was an event held in the North on the 17th February, at Queens Park Savannah in Port of Spain. This event would very soon later ascend to become the main TT National Steelband PAN-O-RAMA competition. In the South, on the 18th of February 1963, a Southern Steelband Competition was held at the Naparima Bowl in San Fernando. Using these same South rules, to be followed some days later in Tobago, a Steelband Competition was held at Shaw Park, Scarborough. These competitions would evolve under the regulation of the TT Steelband Association, which later became Pan Trinbago, to be called respectively the North, South & Central and Tobago Regional zone competitions; with the later formation of the Eastern Region in 1976. 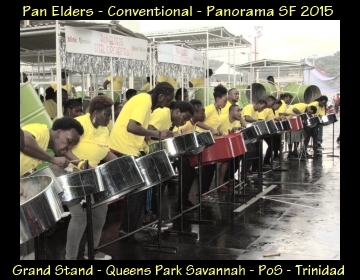 Top competitor steelbands from these Regions would then qualify to enter the TT National Steelband PAN-O-RAMA, the finals of which became the 'Mecca' of pan, at The Grand Stand, Queen's Park Savannah, Port of Spain, Trinidad. Panorama involves virtually all the steelbands in Trinidad and Tobago. 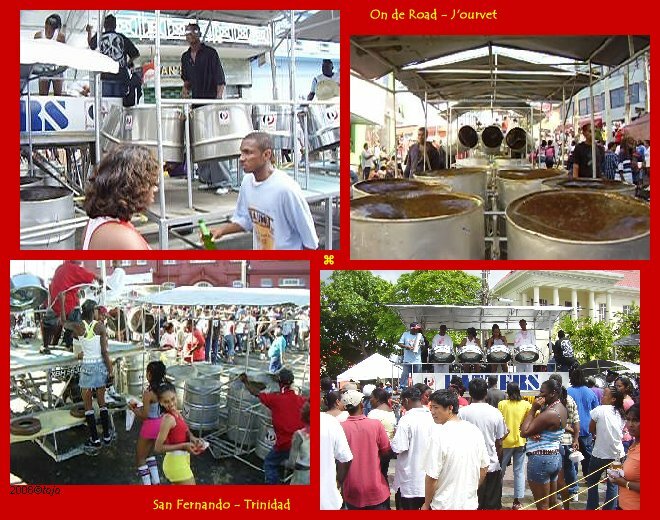 Conventional and The Single Pan Bands (SPB's) (Traditional) steelband categories are represented. 1998 saw the introduction of the Junior Panorama (conventional) category, which has now grown into a highly anticipated and musically surprising event. It is placed in the week before the Grand Finals at the Grand Stand, Queen's Park Savannah, Port of Spain, Trinidad. It includes the Junior steelbands of the traditional conventional steelbands, the pupil steelbands of established Pan Learning Institutions together with student steelbands from the National Schools of TT. Junior Panorama has grown to highlight some of the young and upcoming musical players and arrangers, many of surprising talent. It would be remiss to label them as only steelpan players and arrangers at this time, for many may visit different halls of music in the future. 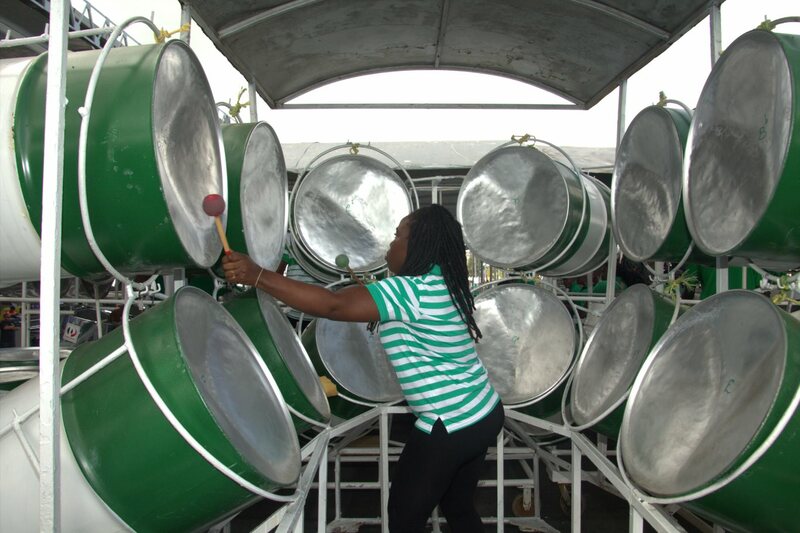 The logistics of moving around large collections of 'oil' drums due to band size and because of the number of the bands competing, the National Steelband Panorama competition begins with rounds of Preliminaries, as they are called, at venues related to the bands physical location. The Preliminaries are held in four geographic Competition Zones, out of which 'qualifiers' emerge to further compete. The physical location of the steelbands home ground will determine which Competition Zone it is to belong. The competition then moves to Semi-Finals in all categories; out of which the Finalists emerge. Following the emergence of the new 2004 Panorama Format, and the attrition in size to the Large Conventional Category; economics decided that the Large Bands move directly to the Semi-Finals, without a Preliminary. 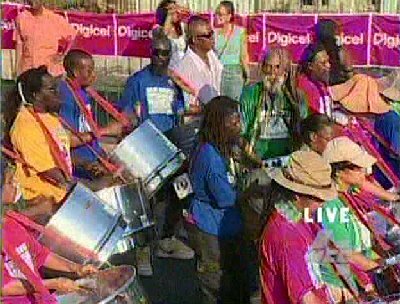 The Large Bands instead face a pseudo-Preliminary called a 'Preparedness test' carried out by officials and adjudicators of Pan Trinbago, at the steelbands respective panyard. Following which, an adjudicators un-numerated score sheet, marked only with suggestions and critical musical comments, will later be issued to the band. This remains in parallel with the established tradition of supplying feedback as 'marked' score sheets, to ALL the steelbands, following their Preliminary, and their Semi-Final, performances. A change arose to Panorama when Pan Trinbago introduced the new 2004 Panorama format. The change affected the Conventional steelbands only, by dividing the competition stable of some 65 steelbands, into 3 new categories. Small, Medium and Large. Ostensibly it brought a long overdue equity in distribution of prize resources and better matched the band sizes in competition. As inevitable, some disagreed with the change, but their argument was weak, and as expected from a culture under stress and from the old-school who resisted any change, was nothing more than the mantra Oh, it masshin' up de culture!. The three main things this new 2004 Panorama format change actually brought about were to do with; first, the amount of prize money attached to Panorama, which increased; second, the number of bands that would actually appear in a finals, which increased; and thirdly, specifying the size, in members, of each of the three new conventional steelband Categories. The size in membership of the bands entering the seasonal TT National Steelband Panorama competition, Conventional Category, is stipulated as follows. Small [35 to 55*]; Medium [60 to 90*] and Large [95 to 120*]. For completeness of data (here); The Single Pan Steelbands (SPB's) Category (i.e. Traditional steelbands) size range is [25 to 45*]. The * just indicates that the maximum includes the count of ALL instrument players; not just pan-players alone. For the first new 2004 Panorama format, the registered stable of 65 steelbands elected themselves to the following category groupings; 25 Small, 22 Medium and 18 Large. Ten years after, in 2014, the numbers had changed to; a total of 90 performing steelbands; 49 Small, 26 Medium and 15 Large; with an additional 8 registered, but no-show steelbands; 2 Medium and 6 Small. The 38% increase in the number of performing bands, shows a 17% (-3) decrease in the Large category, a 18% (+4) increase in the Medium and a near doubling in the numbers of small bands, with an increase of 96% (+24). 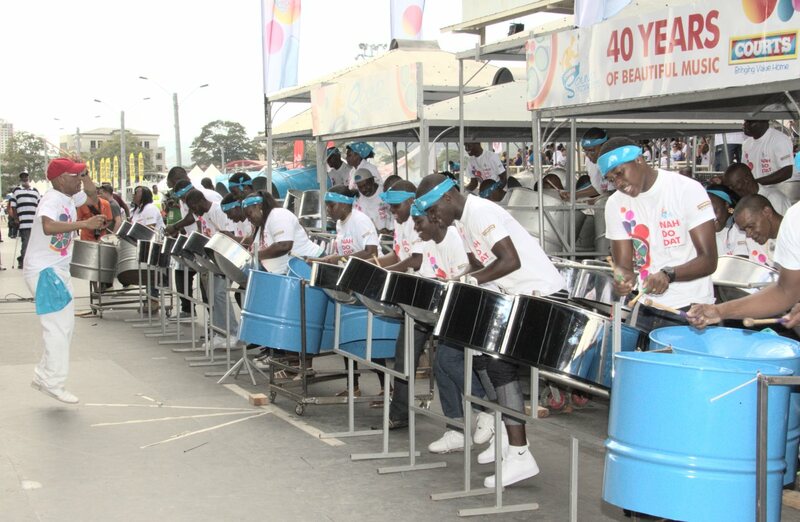 With respect to the number of finals performing steelbands; traditionally, pre 2004, the number of finalists would be set somewhere between 12 and 14. With some rather regular double or triple ties in 12th position; the figure could rise to 15 or 16 at times. The new 2004 Panorama format rules would first stipulate that 8 band from each category would appear in the finals. The actual finals show would now host the Medium and Large categories together, in that order, that would then show 16 finalists; much in line to what had been experienced before the change. The larger change came where the SPB's and the Small show would now be combined, and in that order; to present a Panorama show with 16 SPB finalists; and 8 Small conventional finalists. In this format, it was only the addition of the Small conventional category that added 8 more Panorama finalists than before. With respect to an increase in the Panorama prizes; the new 8 Medium steelbands are granted higher premiums than the lower 8 of the Large band category that they would replace; thus increasing the cost. However, being smaller in size, their top prize started at a lower level than that for the Large category. The 8 Small steelbands however, were an entirely new addition, and with a starting premium pegged around mid-way between that for the Medium and SPB's. With no real figures to go on at this time, but however with a good understanding of the system; a reasonable ball-park estimate would suggest that the cost of morphing the system, to include 8 Small and 8 Medium categories, all told, would have added about 50% extra cost to the enterprise. As to the question of 'Who funds Panorama'? Seen as a major contributing component to the yearly TT seasonal Carnival festivities and an overall revenue attractor to the tourist industry of the islands; Panorama is funded by government bursary to Pan Trinbago, who receive the funds through the grant control body called The Carnival Development Committee (CDC). By 2014, the yearly amount allocated to the Panorama competitions is in the order of TT$ 8 to TT$ 10 million (US$ 1.3 to US$ 1.6 million). Interestingly, Pan Trinbago, in order to finance their own operations, traditionally receive 10% 'tax' on all prize moneys received by the steelbands for the Panorama show. Panorama is only one of many other, some considered contentious and controversial, revenue streams for Pan Trinbago; issues of which may be treated as a different topic, outside this brief. Returning now to the Panorama competition itself and the impact of the new 2004 Panorama format change for the Conventional steelbands; a change that would now herald in two new Panorama winners; the respective conventional winners for the Medium; and winners for the Small categories. The new rules stipulated that the last of the Conventional champions, Exodus , had no rights to automatically play in the (Large Conventional) Finals; as had traditionally been the case for previous Finals winners of the recent decades. This meant that the new change-over, started afresh all categories. Technically, Panorama had been re-set to zero. The subtlety here is that, intentionally or no; Pan Trinbago managed to side step the curiously but imminently pending cultural question, in the light of the issue that was now upseting the steelbands status quo, as to 'Who won Panorama 2004'? In order not to disenfranchise the legitimacy of lineage of the Small and Medium steelbands to be winners of Panorama, the subtle technical re-set, avoided the issue. The Large Category steelbands may have, by common perception only, inherited the rights to the legacy of lineage to some 40 Panoramas, but so too, could the Small and Medium bands now claim; even though Exodus, by dint of its 2004 seasons choice in size, having had elected to be in the Large category, were thus unwittingly strengthening the perceived rights to the Large Category. All technical argument aside, however many numerical truths not withstanding; the common cultural perception of Trinidad and Tobago is that the Large Conventional steelbands category, carry the grand flag of glory, in all rights, to be the masters of Panorama. Pitrotrin Siparia Deltones on-stage doing 'Zanda's' arrangement of Trini at the Large Steelband TT Panorama Grand Finals with the customary group of jubilant supporters, crowded on the left. 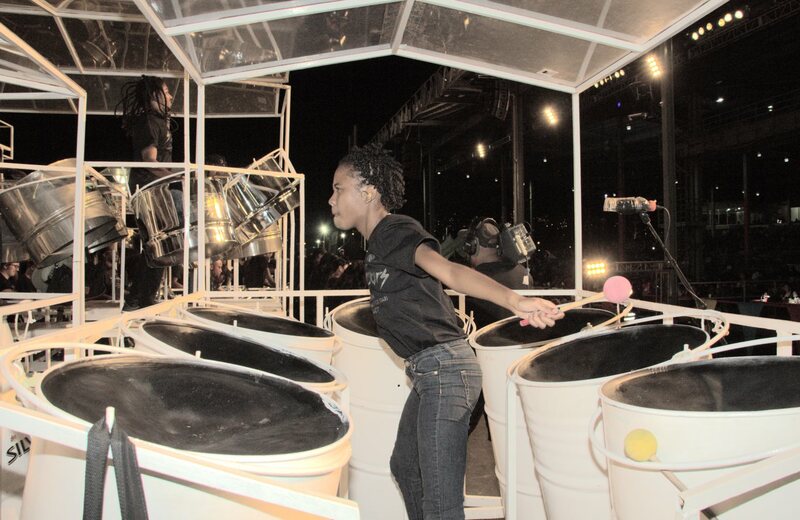 Siparia Deltones placed joint-7th in the 2011 Large Steelband TT Panorama Grand Finals. We summarise here, using some previous information scattered around this page, to focus on some odd issues, related to the Panorama bands sizes. We recall that the size in membership of the bands entering the seasonal TT National Steelband Panorama competition, Conventional Category, is stipulated as follows. Small [35 to 55*]; Medium [60 to 90*] and Large [95 to 120*]. And for The Single Pan Steelbands (SPB's) Category the size range is [25 to 45*]. The * just indicates that the maximum includes the count of ALL instrument players; not just pan-players alone. When the bands arrange themselves for the Panorama competitions, they attempt to field as many players as they can muster. It makes sense; with a full complement, your halfway to winning already, as the competition can't be bigger than you are! The sizes of the bands thus approaches the upper limits as set for the conventional and SPB steelbands. The size of the steelbands at the beginning of Panorama in 1963, was somewhere in the region of 30 to 40 members; more likely on the lower limit. That means they were smaller than both the Small conventional or the Single Pan Steelbands we hear today. As Panorama evolved over the years, their size grew in number. We recall that the largest Panorama steelband ever to perform, was the record set in 1975, when the Maritime Life Hatters hit the Savannah's Grand Stand finals stage, to overhang it with "bass racks", sporting 167 players (Under dispute; cf. Cavaliers). This as was said, precipitated a rule change, that for a time, set the upper limit initially to 100 members (New data 2016, Pan Trinbago SC [provisional]; where the previously indicated number was 140 from an unconfirmed though not yet discredited source), for what we now consider as the Large steelbands. By the early 1990's it had risen to around 120 players; in 1998 fell under protest to 100; and within a few years was back to 120; and then oscillated between 100 to 120 players as they fiddled the numbers between the Preliminaries and the Finals. The figure now stands at a steady maximum of 120 (2016). The length, or duration, of a Panorama Tune today is different from what it 'traditionally' started at in 1963, and like the steelbands themselves, went through a process of evolution to arrive at its present length. As we shall note, some change was due to natural 'musical evolution'; whereas marketing strategies and media recording limitations, brought on changes that would guide the time format set for the present era. Where the early Panorama tunes came out of the Neville Jules 'Bomb tune' stable; they were short and sweet, repeat verse and chorus, with some extra inside modulation work to sweeten 'for Panorama'; the tunes were in the order of 3 to 4 minutes long. At the beginning, but only for a few short years, the tunes were 'laid back' and moderate in pace. But as the idea of representing the 'Carnival Spirit' began to pervade the thinking of the arrangers, a 'Cultural Panorama tune' began to evolve. The speed began to increase, using up more 'notes', and the complexity of the tune began to grow in response. The idea of a 'Panorama arrangement' had arrived. Going up the 'learning curve' is what the Panorama arrangers were doing, and the tunes were getting longer in the process. What was actually musically going on in the development of a Panorama tune, will be outlined as a subsequent topic; but here we can say that the arrangers were learning and developing a new cultural music craft, specific to the steelbands of Trinidad and Tobago, the likes of which had never been explored before. The music was moving from being just the rendering of a 'popular calypso' to becoming a 'symphony to carnival' in its own right; steelpan music for the Panorama stage. The 'popular calypso' acting as the skeleton on which to build a complex symphony, voiced by the still changing and expanding ranges of the steelpan instruments themselves. By the early 1980's, some 20 years later, these Panorama 'compositions' had constantly grown to be over 10 minutes in length. At this length, and at Panorama pace, the pieces were supremely challenging to compose, to maintain that sparkle of carnival, to hold that interest, to outperform the opposition. Again, unusual here, is an art-form in competition. A mixed metaphor of art competing for instant emotion. The about 10 minute 'average' length became the defacto standard for the next 20 years of Panorama. This 10 minute 'average' represented the levelling plateau in the rise of creative expression mixed with a practical length for a tune. This length was about right for the maturation of this 'evolved cultural music-form' of a Panorama tune. Taxing in the extreme for the Panorama arrangers to, year after year, produce an exciting and endearing piece of music, while maintaining an originality of style and surprise in expression. Based on the foundation of Western musical harmonic traditions, the Panorama tune contains many recognisable musical compositional devices in its structure. A start, an end, bridges to parts, change-keys, tonal and rhythmic reharmonisation of theme, to name but a few. But there are more devices that are specific to a TT Panorama tune. Invented runs and expressions specific to the steel drum or steelpan, some of which have become local musical clichés, for use or abuse, as the case may be; together with melodic and rhythmic structures drawn from the indigenised Caribbean, African, Asian and European cultures that cohabit these twin islands. All of this, as referenced in light local satire, compressed into about '10 minutes of glory', by the collective hands of the steelpan players, the pannists, whom in the main (95%), are not musicians at all. Pure magic. With the advent of the Compact Disc (CD) in the early 1990's, the 70 minute media capacity limit began to have an effect on the organisers of Panorama, as they wished to have the Finals, at least, available on disc. A 15 steelband Final of 10 minute pieces would produce about 150 minutes of music; a tight squeeze on a double CD of 140 minute capacity. With luck, some renditions would be short, so it could all just about fit. Thus in the latter decade before 2004, the rules reflected some of this concern, by bringing the finals down from around 14 to 12 bands; and placing a limit of 10 minutes on the tune. The introduction of the '2004 Panorama format' that split the Panorama into the 3 categories of Small, Medium and Large steelbands, was initially informed by the 70 minute media limit. The 2004 rules stipulated 8 band finals with tunes 8 minutes long. That was 64 minutes of music; even with a tie bringing in an extra band; that was a one CD per Category Final; it would all fit. That the finals moved on, by 2014, to include 10 bands per category; is a completely different story. With the technical development of audio and video compression techniques, improvements to the media itself and smart technology media players; the storage limits of CD's or DVD's no longer remains as an issue to a Panorama tune. A little amusement can be had from a removed interpretation of the existing Panorama time rules. For the conventional steelbands the limits are 8:00 minutes (± 30 seconds) and for the Single Pan steelbands (SPB's) 6:00 minutes (± 30 seconds); before penalties apply. Of note it that the mighty Phase II Pan Grove performed a well out of the box 6:58 minute piece for the 2014 Large Panorama Semi-Finals, without penalty. What's a Panorama without Phase II? Mighty indeed. On the other hand, a memorable time incident occurred at the Large Finals of 2007, held in the South, that might have tipped a very fine balance against the very Phase II, who were at the time vying for a prestigious 'three in a row' win. A superbly controlled Trinidad All Stars was however in the runnings. The bright red characters of the digital timing clock, that was somehow large in the view for the proceedings of those 2007 Finals, and whizzing to completion of the All Stars tune; to the delighted amazement of all observers, after all that; stopped at a startlingly impressive 8:01 minutes. All Stars got it. Regardless to the rules, the bands always broke them and Pan Trinbago was always lax. This went on all the way till about 2004 when Pan Trinbago did start to poke around inside the bands, in monitoring their new 2004 Panorama format of Small, Medium and Large bands, to make sure that the bands were indeed Small, Medium and Large. This was when it began to upset Phase II Pan Groove in particular. It was an arduous task for the Pan Trinbago stage-crew as; it curiously evolved a set of people, the 'counters', adept at finding misnomers, but also with a strength of character to avoid crisis, dampen tempers, and cleverly officiate the desired decrease in numbers, on the spot. They developed a 'nose' for the task, and knew in advance, which bands would be troublesome. There is no 'might be', but only 'would be' here; steelbands are a difficult bunch at the best of times. I personally call these characters the 'tiger counters', having met a few, but thankfully when in discussion, mainly outside of the competitive arena. The word 'Lion' is too tame; you don't need pride, you need action! 'Tiger counters' hold rather a unique position in the Panorama arena, as they represent the only group of officials who have the immediate power to stop a Panorama steelband dead in its tracks. No matter what position of authority you may hold within the ranks of your steelband, Captain to Manager; if, in the eyes of the 'tiger counter' you have crossed that now highly preverbal 'red-line', you immediately run into that other preverbal 'brick-wall'. Uniquely backed by the 'Rules of Panorama', 'tiger counters' must have one of the most succinct job descriptions on the planet; 'If you're in, you're in; if you're not, you're out!' The power of the 'tiger counters' was demonstrated at an 'incident' that occurred at a SPB & Small steelband Panorama Finals, Skinner Park, San Fernando; that had knock-on effects to the Grand Finals in Port of Spain, that year, 2014. We are reminded that Panoramas can be immensely tedious; it takes all night and tries your patience. The Semi-Finals have generated some of the longest shows ever. With some 45 steelbands to cross the stage in the day; and if you have to count them, it's a nightmare. The shows goes for a 09:00 AM start (which they usually miss) and may end at 04:00AM to 05:00 AM the following morning. That's 19 Hours showtime, 6 Hours playtime - that music; 25 minutes for the band to set up, play for 8 minutes and leave the stage. A bit slow; they should be able to do it all in about 20 minutes. On a 75 member band average; we are talking about 3,375 hyped up musicians will be crossing the stage; and you should be counting them! And an incredible 9,280 hand crafted, finely tuned, unique steel drum instruments will cross the stage. There is other equipment involved as well. You have witnessed, oblivious to is value, a capital investment of some TT$ 31 Million (US$ 5 Million) cross before you. As to the actual cost to the bands themselves, to be here to entertain you at a Semi-Finals; with all the accumulated fees of tuning, the arrangers, the drillers, the paint, the clothes, the food, the decoration, the accumulated transport; just to arrive at a Semi-Final; a mere TT$ 5.4 Million (US$ 870,000). All these figures are authentic. Organising this stand of musicians is prodigious. Controlling it is impossible. It all appears to just about happen. When it comes to the Finals, those bands that happily make it, and as we are reviewing costs at the moment; have now invested an additional TT$ 45,000 to TT$ 90,000, depending on size, to that average of some TT$ 120,000 (minimum) it cost to appear in the Semies; for a Finals showtime cost of between TT$ 165,000 to some TT$ 210,000. Frugal bands can do it for a bit less, but not much less; and pampered bands are known to expend double that budget. If you are a Tobago band, Bobb's your uncle, double it! A few years back (researching), the number of conventional steelbands, in all categories, appearing in the finals was raised from 8 to 10. This was because, in the Large Finals anyway, everybody was bored s***less by the predictable monotony of the same bands appearing in the Finals, year in, year out. An absurdity in itself, if fair mathematical probability statistics were ever applied to the problem. Oh! 'fair' is the scientific term for 'un-biased', by the way. So the two extra bands per category, it was argued, would now add some unexpected variety to the show. The variety is certainly there, but the unexpected has yet to be achieved. This clipping is a little historical gem of reporting on the steelbands, from the West Indiana Collection archive at UWI. 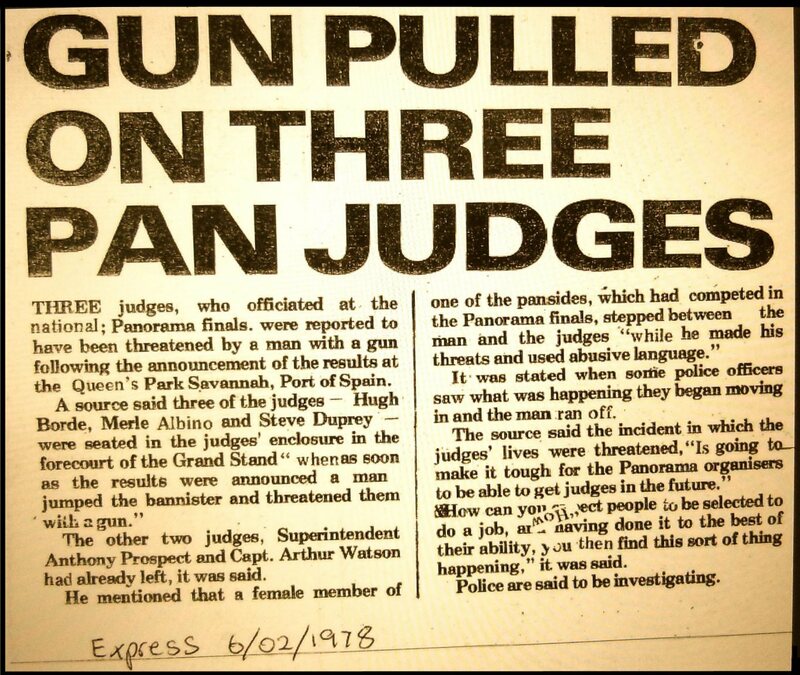 Taken from the TT Express, Carnival Monday 1978; its story relates to the weekends Saturday's Panorama Finals at QPS, PoS, Trinidad. Apart from the main headline, which may be an uncomfortable reminder to some of the antics of a past discontented supporter, which story is partially accounted in the 'Panorama Rules' article alongside; the incident still has some resonance's with aspects of today's order of things; but more revealingly, contains other references of more endearing value. Speaking from some 37 years in the past (2015,present), the reporters cultured demit to 'pansides' is a clue as to how well we have moved culturally forward to now admit the 'steelbands' and 'steel orchestras' as perceived today. Of the three adjudicators named; one, Steve Duprey has sadly passed away (Brother to the legendary 'Blue Lady' of Laventille, of the sharp tongue, diane (and don't dare capitalise the spelling! ), who ferociously supports all panpeople; who penned the 'Panmans Prayer'; who has fussed the Northern and South-Central regional offices of Pan Trinbago to order, during her tenure in those parts; who consistently harrangs the custodians of Desperadoes and Hatters to 'do better' in, dear I say, a watchful motherly way); and of the other two, Hugh Borde (Captain Hell's Kitchen and later Tripoli of Expo 67 fame; and associated with The National Steel Orchestra (1964)) and Merle Albino (now married), despite the fright of that day, are still staunchly active in this arena today. Of the absent adjudicators; Superintendent Anthony Prospect (10/02/1928 to 2000), arranger, composer; instigator and musical director of the TT Police Band and memorable festival arranger for Desperadoes and Casablanca in particular; worked with Renegades; earlier championed by the Mighty Sparrow in calypso The Governors Ball of the mid 1960's; is here noted in practicing his commitment to the art-form; for which he is still fondly held in high regard. The accompanying Captain Arthur Watson, was also a member of the TT Police Band. But the real gem here, is the unnamed heroin; member of one of the 'pansides', who directly confronted the disaffected gunman (the downside being that she probably knew him! ), providing us a rare 'roll model' of affirmative feminism from that era. A reasonable guess would place her as being about 20 at the time of the incident; she would now be in her late 50's to mid 60's. Someone surely, should remember who she is. Can't we find her, and give her some distinguished medal of honour for defusing a potentially tragic situation; our upstandingly brave panwoman? At present, only a limited note will be made here about the Panorama rules as they are available on the internet on the official Pan Trinbago web site. Some copies, of historical interest, are also available from this site. The TT National Panorama Steelband competition rules come in two sets. Rules for all the Conventional Steelbands, Small, Medium and Large. Rules for the Single Pan Steelbands. As one would expect, they stipulate and numerate the; status for qualification, dates, times, venues, band sizes, procedures, cautions, modes of conduct, adjudication principals, scoring methods, disciplinary procedures, penalties, recording rights, arranger conduct, presentation requirements (banners), accepted stage practice and performance procedures, define the parameters of the Preliminaries, Semi-Finals and Finals, prize allocations (but not the amount for the prizes themselves; that is given in a separate document); among much other detail about Panorama. Apart from their implicit use as being the Law of Panorama, and to be taken seriously (which they are) by participant steelbands; they have another quality that can often be overlooked. The Rules of Panorama are no easy documents, they have evolved, side by side with the steelbands they govern, over the past half-century, and some. Within their content, coded into the dry phrases of legalise, is an inferred history of sociological conduct and traces of technological change that have affected both the organisers and participants of Panorama. From it, in a very cursory account here; we can glean that the steelbandsmen (remaining here, characteristically gender-bound with the period) were no easy people. They were vicious in their pursuit to win Panorama. They would use every means at their disposal to disadvantage an opponent, and would wilfully physically obstruct a competitor from appearing on stage in a timely manor, who thereby acquired a penalty; this went on until such a time that the rules disavowed this practice. They were clever in their use of excuses for any perceived infringement they themselves might have committed. Every excuse they made, had to be countered by a rule, so that they could not make the same excuse again. Their member numbers had to be regulated, the lengths of their tunes had to be regulated, and at both ends. Some arrangements are noted to have lasted 15 minutes; others had to be penalised for unpreparedness and with 'last minute laxness', with tunes that were obviously short. They would mount the stage on signal of a red flag (or light); commence play to an amber flag (or light); and dismount the stage to a green flag (or light). Much of this probably evolving through necessity of function, in a noisy arena. These movements are also made under threat of penalty, one point per minute, for late movement to mount, and curiously for tarrying to dismount, the stage. But once on stage; no issue of penalty presently exists for the time of setting-up. They would cast scornful verbal abuse, and on a few odd occasions even threaten physical attack, upon the adjudicators on receipt of poor results, or for perceived bias towards another band. That is why the adjudicators presently vacate the venue, before any Panorama results are announced. (See attached news item). These are some of the cultural eccentricities, hidden in the rules. The TT National Steelband Finals for the Single Pan Steelbands and the Small Conventional Steelbands. On the Thursday preceding Carnival. Usually starting at 06:00 PM. 16 SPB Finalists; followed by; 10 Small Conventional Finalists. The TT National Steelband Finals for the Medium and Large Conventional Steelbands. The Grand Stand, Queen's Park Savannah, Port of Spain, Trinidad, TT. On the Saturday preceding Carnival. Usually starting at 07:00 PM. 10 Medium Conventional Finalists; followed by; 10 Large Conventional Finalists. An incident in 2014, at the SPB and Small conventional Finals, Skinner Park, San Fernando, Trinidad, went on to affect the Grand Finals of the Medium and Large category at the Grand Stand, Port of Spain. We trace the incident, visit the perpetrators, and review what the impact was to the Grand Finals 2014. 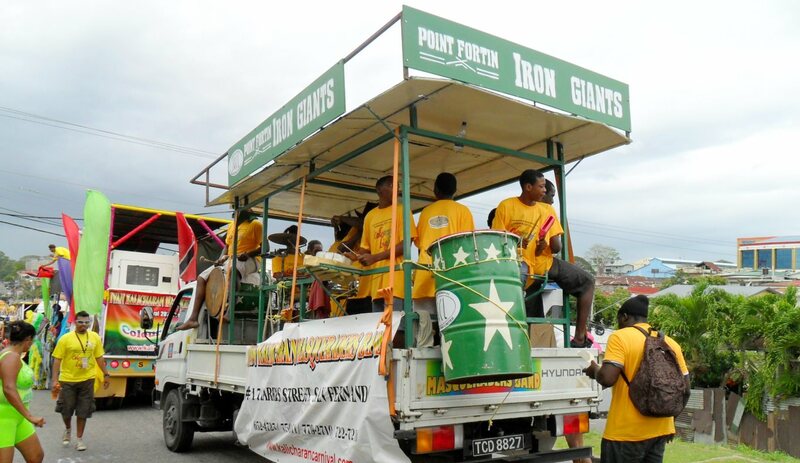 The popular South steelband Petrotrin Siparia Deltones have had mixed fortunes since the passing of their much revered captain Ellis Knight in November 2007. Perceived as a Large band, with an illustrious past, having played the works of J. Samaroo, C. Bradley and L. Sharpe, among others; having visited Canada; run noted musical workshops in their panyard; and noted as one of the few steelbands with a 'stage side' 'soloing' across all voices; Deltones hold an enviable pedigree of musical achievement. Jumping variously around the conventional categories of late, and even winning a Small Panorama 2007, with 'Zanda's' Fire Ball, Deltones are more noted for their exploits on the Large Finals stage with 'Zanda's' distinctive stylistic arrangements of I'm not Drunk and Trini; which remain two of the very few 'listenable' and 'memorable' Panorama tunes emerging over the past decade and a half. Being home to the capricious gentle-giant arranger/musician Akinola, Deltones seem, again enviably, to have the music-seen well 'corked'. However on the other hand, questionable management practices of late brought the band to its knees, with respect to attracting players; and they moved 'late' to Small category for season 2014; in the process earning zero brownie-points from Pan Trinbago and the yellow-card, 'trouble'. Their Zanda/Akinola rendition of Play More Local took them to an 'expectantly' close 2nd place in the Semi-Finals; setting the scene for the following issue to arise. Riding on a 'Large' head, forgetting past ills, smelling the glory of a Finals, band membership, suffering the usual Trini turn-around, once somebody else had done all the hard work, returned to Max-out the Small category limit in panyard practice the week before the Finals. Flushed with excitement, to add spice to the proceedings; characters adorned in colourful carnival accruements, were to accompany the ensemble through the Finals; or so it was expressed. Deltones profusely mounted the stage at the Small Finals, and promptly tripped over the 'tiger counters'. As previously expressed, the 'tiger counters' are sharp, very. Noting that characters adorned in colourful carnival accruements do not appear anywhere in the 'book', they concluded that they should not appear anywhere on the stage ether; they promptly cleared the entire stage of all personnel. Sharp. That left the stage full of instruments which they could count. Sharp. They concluded from their count that there were 7-'overs'; and returned off-stage to deliver the only ultimatum. What could have been sorted in 5 minutes, fell apart when Deltones lost their bottle and spooned out dispersions, all over the place, spilling as far as a local broadcaster. The situation spiralled to fracas until cooler heads put some sense into it. With senior Pan Trinbago officials now in attendance, the situation chewed up over half an hour of showtime before settling to order. Deltones were allowed to proceed to stage using the correct number of players; and 'penalties' to be decided at a later closed conference of the Pan Trinbago executive; any prize due, presently to be withheld. The resulting deflation of Deltones came in two stages. It would sadly affect the players more than the band itself, as shall be shown. Deltones placed 2nd, Panorama 2014 Small Band, missing the top by 6 points; but drove away empty handed. This only emphasised the 'no-brainer' that the institutional Siparia Deltones Steel Orchestra has the musical resources to go places. Unaffecting the institution of Deltones; the Pan Trinbago deliberations came in with the penalties, about two weeks after the event. With a 'For inappropriate behaviour & presenting more players than was allowed', it was clear that the Pan Trinbago Disciplinary Committee had been activated with the 'Book of Rules' close at hand. Deltones were demoted, not disqualified, in competition. They placed 'zeroth' in competition; nice. They were effectively beaten by everybody. 'Nice' only because it allows the report that; the forgotten band, New World Symphony Steel Orchestra, ET, 49th in the Preliminaries, beat Siparia Deltones Steal Orchestra, SC, for Panorama 2014, and move up to 48th ranking. Other penalties began to bite deeper, but luckily for the band, not as far as they could have gone. A punitive, few thousand TT$ fine accrued; but the next bit stung. Deltones fell to 'last position' (careful - not 10th place) of the Finals; but recall, have no 'place' in the Finals; nice again. This then allows the next curious reporting; Humming Bird Pan Groove, NT, 11th in the Semi-Finals, now placed 10th in the Panorama 2014 Small Band competition (but not 10th in the Finals); La Horquetta Pan Groove, ET, moved up to 9th place in the Finals of the Panorama 2014 Small Band competition; and Crescendoes Musical placed 2nd in the Finals of the Panorama 2014 Small Band competition, replacing Siparia Deltones. All the steelbands that moved up a position in the Small Finals received adjustments in prize monies, commiserate with their new position. Deltones received prize monies, less fine, commiserate with 10th Finals position; a significant loss when compared with the 2nd place prize; all to pure foolishness. The players, having been stilted on their expected earnings over the previous 2 Grand Final Panorama appearances of the band, now faced a third year with low expectation. A situation, that was again, 'not their fault'. It would be fair to report that this incident has been very embarrassing for Deltones, in more ways than one, and one hopes that lessens will be learnt from it. It does however cause pause to reflect that the "Leh we do a 'ting na" style management, that is not uncommon within our steelbands, needs to step up a notch in responsibility. Responsibility for the Pan Culture, still supported and reliant on those who have very little; and who could well do without these types of issues; if all are to properly survive. The Deltones incident, at the SC SPB & Small band Finals; happening late the Thursday night before the carnival weekend 2014. 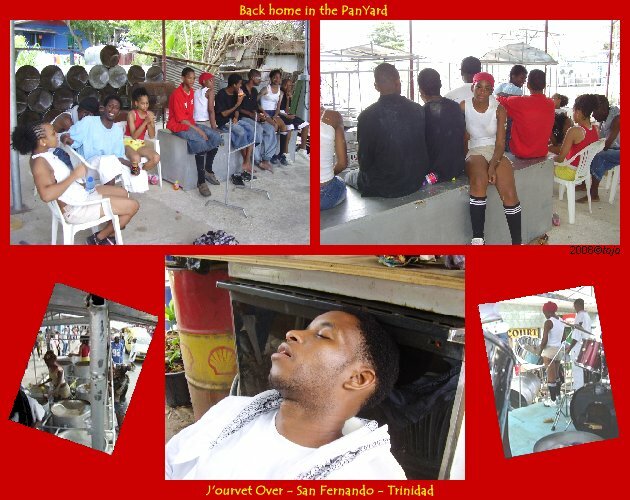 It reverberated through the Pan Trinbago head offices the following day, the day before the Grand Finals. Like fire under a Jack-Spaniards nest, it got them buzzing on the topic of band size, which then heightened their focus on the topic. Stung somewhat by the inflammatory way the South incident had played itself out, with a few lessons learnt, they set about to prevent any such incident occurring at the coming Grand Finals. The Panorama 2014 Grand Finals Medium & Large started around 15 minutes late on its 7:00 PM program start and ended some 9 hours later at 04:15 AM, after the last band played; with the Final results about 30 minutes later. Accounting a show with 21 bands, and a mid-point adjudicator changeover with presentations of about half an hour; Pan Trinbago had averaged just over 24 minutes per band slot-time. In addressing some later complaints about a long show, they had declared that it had been lengthened because of counting the bands. Despite an extra band in the show, Pan Trinbago had done well enough, and had been counting. The figures indicate that they had chewed up just over an hour of show-time doing it. Previous Panoramas indicate a slot-time of around 21 minutes per band. It is interesting to note that we will probably never actually know what incidents may have occurred during the 2014 Grand finals count. Any real infringements would have been dealt with by simply putting out players, and letting the 'pans hang'; the term used for an unoccupied pan instrument during playtime. What we do know is that there were no obvious incidents to upset the show, and conclude that some cool heads must have been in action. The incident in the South had turned out to be a red-flag, and Pan Trinbago, to its credit, had taken notice. Judging Area in the Grand Stand (post Sound Specialists of Laventille - Medium) with the digital clock; and the red, amber and green lights (on post - right), for adjudicator readiness to the band. 07 min: 22.24 sec. The digital clock is 0.20 secs over the timed recorded period for the tune; the 0.20 secs reaction time for the 'stop' person; pretty good timing. The when frustrates you, waiting for the steelbands. But when finally, on each separate occasion, when it does happen, when the music sings, when the iron reverberates in your soul, when you are taken by the rhythm, when you recognise the familiar and hear the unexpected, when you are beaten down and then driven up into ecstasy, when you realise you will never hear it quite like that again, you know then; when you're at Panorama. If you live next to a panyard you're in deep s***! Your predicament just adequately described, as in some cases, you have been putting up with this behemoth of a sound engine, this iron age industrial complex, this collection of dustbins, this focal point of social intrigue, this gathering of Mozart's distant cousins gone crazy, for the past 60 years. Panyards come in all shapes and sizes, and are generally not a pretty sight, with rough iron wire barricades placed around any structures, to protect the instruments from theft. The yards occupy all sorts of places; usually rough abandoned ground, land between buildings or even next to graveyards. The lands themselves may be on loan, rented, presented to or owned by the bands. Sometimes bands have to move if the landlord has other ideas for the site. Some yards are very old and some are new. Some started near trees, used for shade, as is the fabled breadfruit tree of the Invaders yard. Hillside in San Fernando are under a tall chennet tree and Pamberi, north east of the Croisse in San Juan, on their graveyard site, practice in an auditorium under the spread of a massive saman. Some panyards have names of their own, but these are few, and have mostly passed into legend. One was the "Hell Yard" of Trinidad All Stars; but that is for another story. The disposition of the panyards varies. From rickety wooden constructions, with peeling paint, rusty galvanised roof and even rusty drums; through those looking like small back street car parks with covered cages of drums, untidy stacks of steel 'pan-racks' used for transporting the drums on the road, even with the odd old car under plastic storage hoping for better days. Then there are the yards with the concrete buildings with the iron gates. Some small and hot, some open and airy, and some like warehouses. The diversity is enormous. Some yards have areas where the drums are cut and the tops are sunk, and they are scribed and hammered and tempered on open wooden fires, and teased again by the tuners in a process akin to dual alchemy; where an insignificant steel drum rises like the phoenix through the fires and the hammering to be metamorphosed into an instrument of charming purity. It is from these yards, that the name "panyard" is most probably derived. The conditions of the yards and instruments reflect the fortunes of the bands to whom they belong. With hard work and good stewardship, some bands have built themselves substantial yards, adequate facilities and show shiny chromed instruments. Or with the aid of sponsorship from local businesses and the odd supportive local council, bands have been resited to new panyards or had their yards refurbished thereby being more comfortably rehoused. Of quick note, from a topic of detail that exceeds this brief at this time, is the influence of politicians and governments in the development of various panyards. 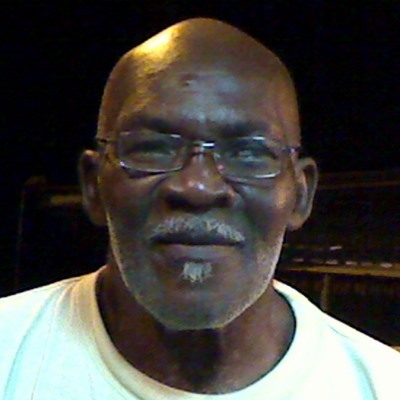 Dr Eric 'Doc' Williams, highly visible with his and his PNM governments interest and assistance to the 'Peoples Band', Desperadoes; is less well known for his vision, insistence and encouragement to local enterprises, to provide sponsorship to all of the steelbands of TT (R. Forteau). In 1990, some funds from an entity called the 'TOSORO settlement', under the NAR government of A.N.R. Robinson, under the direction of Minister Mrs Jane Ule Williams, the Pan Cottages Programme was directed towards structures in the yards of Desperadoes, Sound Specialists of Laventille, Trinidad All Stars, Scherzando, Tropical Angel Harps, Kalomo Kings, Arima Angel Harps and Siparia Deltones. Patric Manning, PNM, is reputed to have approved the Motown PanTheatre project; and in 2000, Sadiq Basch, UNC, promoting Trinmars sponsorship of Hatters, with the follow on of (the same but now renamed company) Petrotrin, sponsoring the construction of their PanTheatre a few years later. There were likely more projects and panyards than listed here. Another quick note, from another topic of detail that exceeds this brief at this time, is the subject: Do the steelbands own their PanYards? Having started, by tradition, by occupying empty lots and undeveloped 'State Lands', all over the country; many steelbands effectively started their tenure as 'squatters'. As to who now owns the plots; a quick guess would suggest that half of them don't; whereas the others have 'permissions', leases, or in fact do own their PanYards. The true state of affairs lays in the files of Pan Trinbago who, in around 2012, pursued a survey of their registered steelbands on this topic. No data has yet arisen in the public domain about this survey. Of example to some issues faced by the steelbands, are the yards of Starlift and Phase II Pan Groove. We must note before continuing, that it is problematic to relocate a panyard, on reasons of simple sociological grounds; in that if it is moved too far away from proximity to the community with which it is involved, the bands identity can fragment, the community lose interest and the band you now have, is not the same as the band you had before; or it may even 'die'. Sittings on lands earmarked for housing development, Starlift and Phase II were requested to move, and were offered alternative locations. Starlift accepted and Phase II declined. Stakeholders of the lands were angered at Phase II's intransigence. Phase II, whose weight in the steelband world is mighty, being at the top in steelband permanence with a duel card of; multiple Panorama wins; and being home to, and mentored by, the iconic arranger 'Boogsie' Sharpe, hold steadily to their decision to stay put. Despite using their weight as an obvious holding strategy, Phase II, more consonant to their community ties perhaps then outsiders, maintain the simple argument; if we move, then Phase II is no more. So we find Phase II Pan Groove in the same place, Hamilton Holder Street, Woodbrook, Port of Spain, Trinidad, TT, today. The common thing about all these panyards is that although at times they are empty and appear dead; there is always a space, an area, an auditorium where some instruments are protected from the sun and rain and laid out, waiting. In some, players will come in small groups to play and practice off and on, day or night. In more fortunate areas, steel drum players of stature and experience will come to share their great love for the instrument and teach groups of local teenagers in music workshops. In early December 1997, the Jazz steel drum wizard Othello Molineaux came all the way from Florida for a week, to do just that, with a group at the Pamberi yard. This activity happens in many panyards, the latest of note being visits of New York arranger Andy Narrel, to teach with Birdsong, in 2012 and 2013. Over the past decade, has been seen the growth of many 'Pan Camps' and 'Music Literacy Workshops' run and organised by the steelbands themselves, with a focus on developing the youth within their communities. But to an industrial world looking in on Trinidad and Tobago, familiar with the concept of "Just in Time" manufacturing, a concept a little advanced for these islands in general, will find an unlikely advocate in our panmen. For just before a steelband competition is due, or just before carnival time, our "Just in time" panmen will begin trickling into the yards to practice. The "Just in time" drives the arrangers nuts! The arrangers know the fickleness of the players only too well. The arrangers know that the "Just in time" players are up to tricks. They are not just here for the band, as the romanticised publicity of Panorama would suggest; the "Just in time" players are around for every excuse in vanity and self interest that you can find. The "Just in time" players are here to grandstand, to get glory, to vie for a contract. The arrangers know that the "Just in time" players do not win Panorama; you need "All the time" players to do that, but concede that a few "Just in time" players could help. People gather to watch and listen. Business has begun and the yard is alive again. And a "Boogsie", a "Smooth", a "Professor", a Stewart, a Huggins-Watts or whichever steel drum garu holds the rein of the band will coax them into musical form. And they practice and practice and practice. You know there is a panyard there. And they practice when the garu is there. And you know you live near a panyard. And they practice when the garu is not there. And you wished you lived somewhere else. And slowly it happens. You know it because you have heard it over and over when it did not. You nearly don't mind, you are used to it now. You are drawn into this numbing phase where you listen docile and beaten. You don't really know what the garu really wants, but you know it is close; this thing that usually isn't written down, but it does not matter if it is either; as it's happening right now and right here, and you wait for it. You are living this repeat because it has now become your tune as well. It starts again, and it goes and you follow each note, every beat, and it goes, and it flows, and it goes, and it goes, and it goes and Yessss! They did it! Did you hear that? Eh! Magic! Ent! They will do it, over and over again, to get it right. And if you are lucky, near a well organised band, you may even hear a different tune. Where ever the band goes; with truckfulls of steel drums, or rolling out of the yard on their 'pan-racks', you are locked into the band. When the "Just in time" steelbandsmen play at that competition, or on the carnival "road", you follow those notes, each and every one of them, as much as the band, because they are your notes too - you earned them; and the steelband owns you. It is not my intention to describe these unique hand made steel drum instruments here, as others have made a far better job of it. Ulf Kronman, in his book Steel Pan Tuning, has done excellent work on this topic; and it is to his internet pages that these links lead. He presents many practical pictures, and much informative information, on each of these instruments. His further references to a STEEL PAN HISTORY and THE STEELBAND are additive to these discussions. The reason for naming the highest pan of the steelband tenor is historical: In the early days the lead melody was played on a pan with less than 10 notes. These notes were bigger than on todays tenors and the pitch was in the tenor range - therefore it was suitable to call the pan a tenor. As the instrument developed, more notes were put into the tenor to increase its range. The new notes had to be made smaller, thus putting the pan in a higher tonal range. But the name tenor prevailed. Today it would be more proper to call it a soprano, which is also the usual case outside Trinidad. No reference to the steelbands of Trinidad and Tobago could hold any weight, without some reference to the extraordinarily dedicated and talented men and women, who have in the past, or endeavour today, to make it all happen. These are some of the pioneers; steel drum makers, tuners, players, arrangers or composers who invented the steel drums, or captained bands, or created new sounds, or bent the rules, of not only music, to issue in this new dimension of musical experience. These are the people of the drums of steel, the poets of the soul in iron; the fathers and the mothers of steelband legend; the children and the heralds of our future pan. These are our Pan People. Pan Trinbago represents the head of a body comprising an affiliation of members drawn from all the traditional cultural steelbands of Trinidad and Tobago. Its official name is Pan Trinbago Inc., considers itself as an Association of members, operating under a Constitution (1986) with an elected executive; with an objective being to ...'act as the sole representative for members and member Steelbands in all matters relative to the development, promotion and performance of Steelpan and Steelband music within the Republic and throughout the world in its capacity as the World Governing Body for Steelpan and Steelband music'. Pan Trinbago has a head office, The Secretariat, in Port of Spain, Trinidad, and four regional offices; Eastern Region in Tacarigua, Northern Region in Port of Spain, Southern & Central Region in San Fernando and the Tobago Region in Scarborough, Tobago. At present, Pan Trinbago controls all aspects of the TT National Steelband Panorama competitions; where any steelband that wishes to participate in the Panorama competitions must have been a full member; of minimum two years standing. Outside the purview of Pan Trinbago are; all non-member steelband ensembles operating in TT together with a large number of National School steelbands; except those ensembles of National School steelbands that may have elected to become members to participate in Junior Panorama. Pan Trinbago's claim to be the World Governing Body for Steelpan and Steelband Music is facetious at best, having no recognised legal authority in these matters outside of TT. 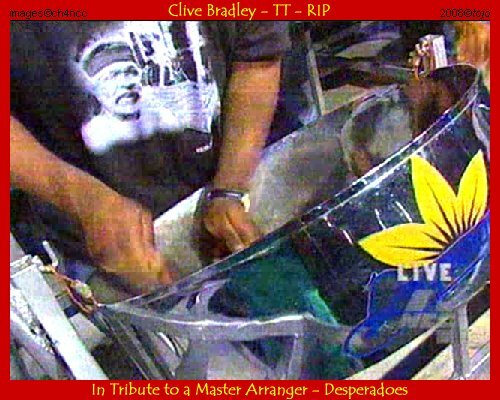 The claim is disputed by many steelpan bodies external to TT; although some do pay tacit respect to Pan Trinbago, mainly in reflection to their acknowledgement that TT is the Home and the considered 'Mecca' of Pan. Without an International Charter of Steelband Affiliations, similar to the charters operated by The United Nations, there is little hope that Pan Trinbago could otherwise aspire to its claims. This status of Pan Trinbago began to change however, in 2015. 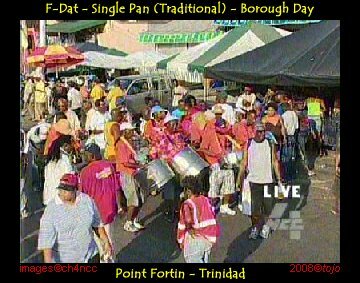 Pan Trinbago is itself an evolved body dating back to the beginning of the steelbands earlies. Starting as a loose association of steelbandsmen around the late 1940's called the Associations of Steelbands, it became an official body: The Steelbands Association, 1950 - 1963. In August 1962, Trinidad and Tobago relinquished it's British Colonial Dominion status and became an Independent Nation; but remained as a member of the British Commonwealth of Nations. Under the fervour of nationalism, the association moved shortly thereafter to be named the National Association of Trinidad and Tobago Steelbandsmen, 1963 - 1971. In 1971, in a debate to more strongly define a universal identity (see below) its name was changed to Pan Trinbago, 1971 (Ref: G Goddard) to 1986. In August 1976, Trinidad and Tobago became a twin-island Republic; but still remained a member of the British Commonwealth of Nations. The Republic, being much distracted by other priorities, took a decade before returning to address the matters of the steelbandsmen. 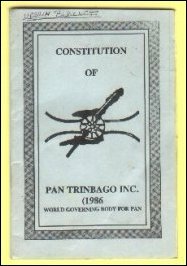 In 1986, by an act or Parliament (Act 5 of 1986; Senate 28th January, House of Representatives 28th February, Assented 14th March) to the present, Pan Trinbago became incorporated under seal as Pan Trinbago Incorporated. For this Assent, it also received it's first constitution, The Constitution of Pan Trinbago Inc. (1986) and received the monica World Governing Body For Pan; registered as a non-profit organisation. In 1992, the government declared the steel drums, or the steelpans, the National Instruments of Trinidad and Tobago. In August 2015, at the International Conference and Panorama (ICP 2015) held in Port of Spain, Trinidad, Pan Trinbago Inc. in an attempt to strengthen its claim to be the World Governing Body For Pan, made strong legal associations with the steelbands of Britain and France; and more loosely bound associations with the steelbands of Canada, the USA and Japan (which may have also included the steelbands of Cuba, from which a delegation was present, but whose actions are here presently unconfirmed); under documents called Memoranda of Understanding (MOU's). In the last quarter of 2016, Pan Trinbago Inc. fell into disrepute with allegations of internal corruption and of mismanagement of funds; among some other issues. The outcome as to the validity of these allegations and issues, remains ongoing at this time. What may not be directly apparent to the casual observer, or nonchalant visitor, or one who discovers a 'pan' in TT for the first time; is that in Trinidad and Tobago and many other countries as well, is that the steel drum instrument has matured into, and is now fully accepted as, an ordinary musical instrument. It is used with the same degree of casuality; or engenders the same passioned obsessiveness; as that displayed by musicians of the saxophone or guitar for example. 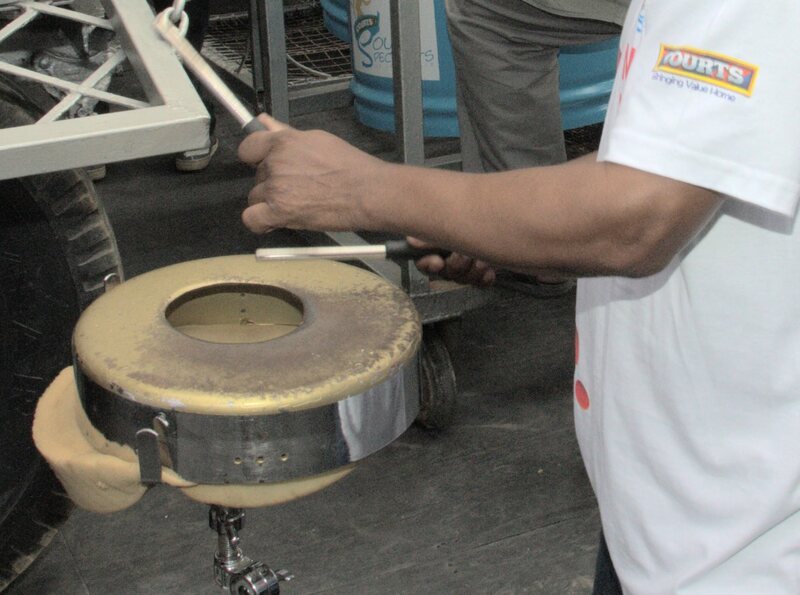 Playing the 'pan' instrument is taught in some schools, particularly in those assisted by the TT government 'Pan in Schools' programme; at the University of Trinidad and Tobago (UTT); at the University of the West Indies (UWI); at some specific 'Pan School' panyards; and at the panyards of some of the traditional Institutional Steelbands which run 'Pan Camps' or 'Steelpan Music Literacy Workshops' as they are called, as well. Players learn to read, write and play music on 'pan', and are given reference to the 'History of the Steel Pan and the Steelbands'. The 'steelpan' can be found in some homes and at the hands of some 'street musicians', on some street corners or near a popular beach. Young and seasoned musicians alike, go to the panyards and play and practice, in that middle time, when the band's main membership are away from using their instruments. Extemporaneous jam sessions evolve. Talented solo players and seasoned ensembles are recognised, admired and sought after. Some steelbands now play some tunes from, or aided by, a music score. Composers and Arrangers for steelband music, now use electronic and IT technologies to write, read and distribute their music. The more traditional methods of; 'by vibe' directed by example or by vocal-delivery, or by 'rote' as it is called, is still alive and well and flourishes from the bands respected arrangers or musically talented associates. Through the strong and heady rhythmic roots of calypso; the restrained, scornful and abstemiously pious directives of religious congregational appearances; the Colonial classical bias of its early wealthy supporters; the romantic interlude of "Yellow Bird" tourist and Hollywood "Rum and Coca Cola" patriotism and popularity; the steel drum instruments, as with the steelbands themselves, have now moved on to new dimensions in the experience of sound. Beyond just the traditional local day-use music-forms of the African influenced Calypso, Soca, Power Soca, Groovy Soca; the Colonial Spanish influenced Parang; the Asian influenced Chutney and Chutney Soca; the Jamaican influenced Reggae, Ragga and Concious; excursions into all areas of world music, from contemporary Pop, R&B, Country Western, Latin, Alternative, Rap, Hip-Hop, Hi-Life, World Beat, Jazz through to Western styled European Classical music, are all being visited. Additionally, new compositions, specific to the voices of the steel drum instruments themselves, are being composed, rendered and explored here, in Trinidad and Tobago. The steel drum instrument or 'steelpan', still in the plastic phase of its development, has some way to go before it becomes common place and ubiquitous. It is still a hand crafted and craft tuned instrument; although phases of its manufacture have been mechanised. The sound it renders, copied with great precision, but still missing a little touch of its dissonant spectral heart, lies resident in the electronic brains of such popular synthesisers as manufactured by Casio, Roland and Yamaha - to name but a few - and indeed coded - 'pitched percussion, metal, steel drums' - within the electronics of nearly every sound-synthesiser chip-set - which could be part of the very computing-device you are using right now - is now recognised, the world over. The forms of music that the steel drum instruments, together with their head of steelbands, will reproduce in the future should thankfully remain limitless. It can only be hoped, that as these instruments mature; as the steelbands spread and clone across the globe; that a nuance of their rhythmic islands soul, remains.